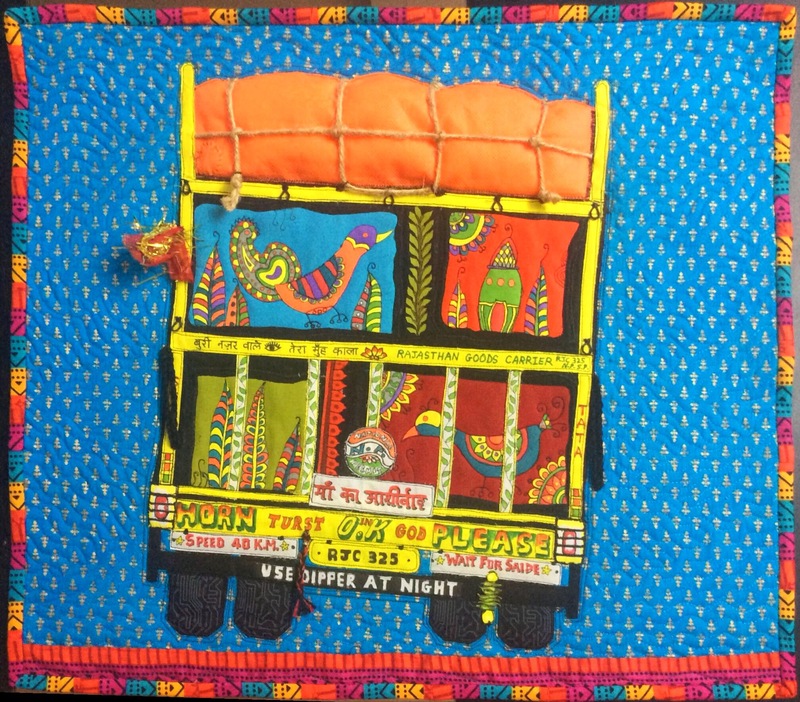 I did tell you my quilt won the first prize in the Husqvarna Viking India, Pfaff India, Handi Quilter India Quilt Competition 2015? 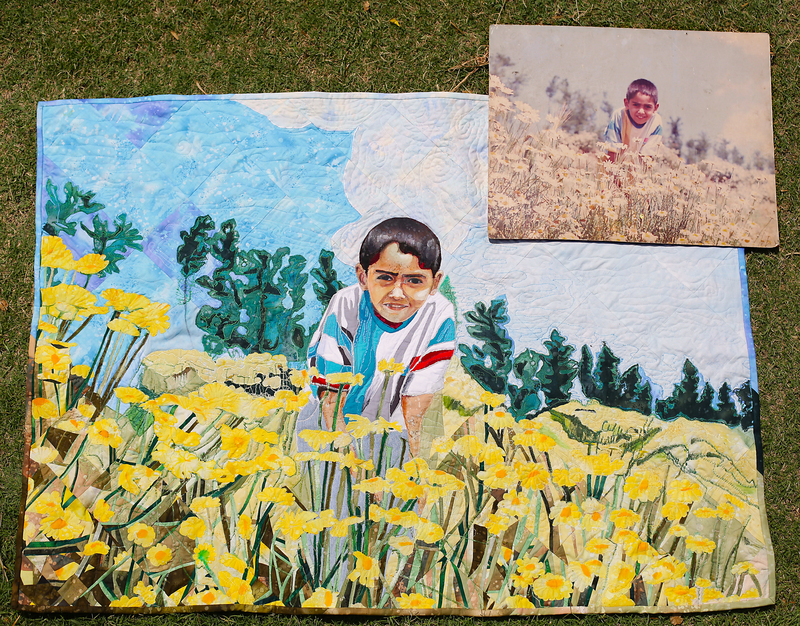 I also promised to share with you the story and the making of this quilt! 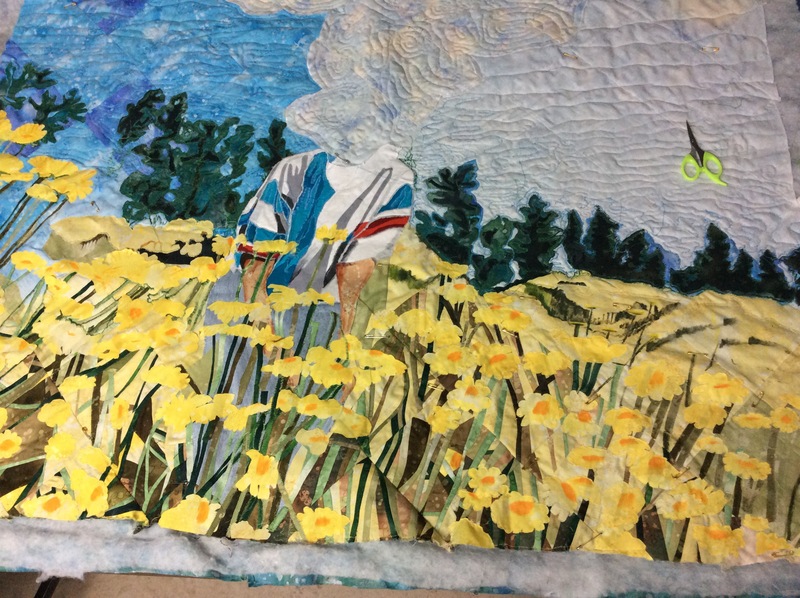 So here it is, my quilt “Seasons in the Sun” ! Original Design based on a personal photograph, no copyright issues. Size – 36.5 x 50.5 ( after blocking). Fabric Used – Cotton fabric `Fossil Fern’ by Benartex and poplin solids by Umaid Mills, India ( entirely from my stash). Stabilizers – Heat n Bond Red and Pink, local fabric fusing single sided as well as double sided. Threads – Cotton, invisible nylon, polyester blend and rayon silk. 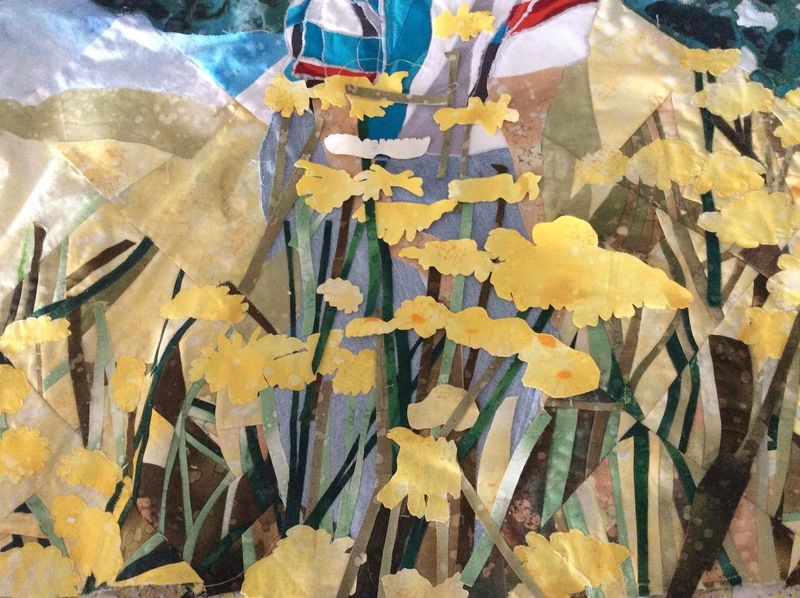 Techniques – Regular piecing, foundation piecing, raw edge appliqué and fabric fusing (with paper backed stabilizer), painting using Derwent Inktense pencils. 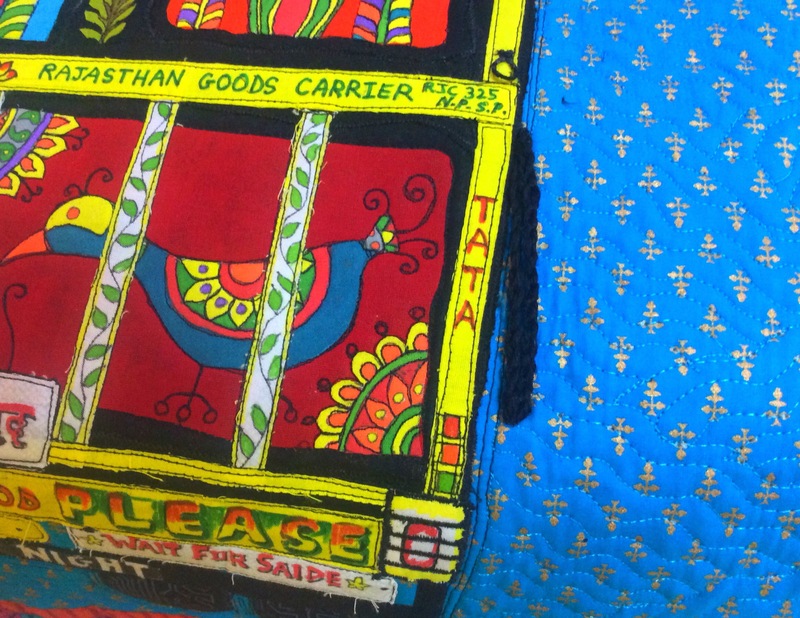 The Story of the Quilt – The Quilt that Wouldn’t Not Be! 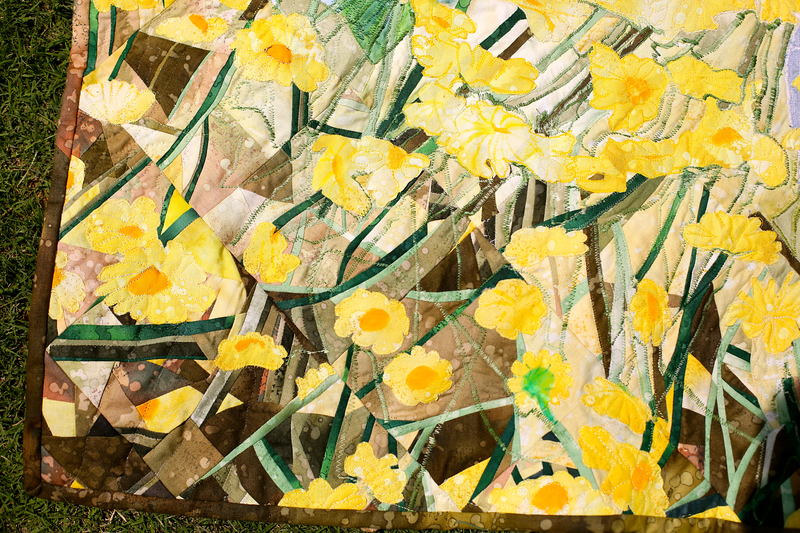 When I first read the theme for the Competition, my reaction was, “Oh, no!” I have painted a lot, but flowers, landscapes and still life only bore me. 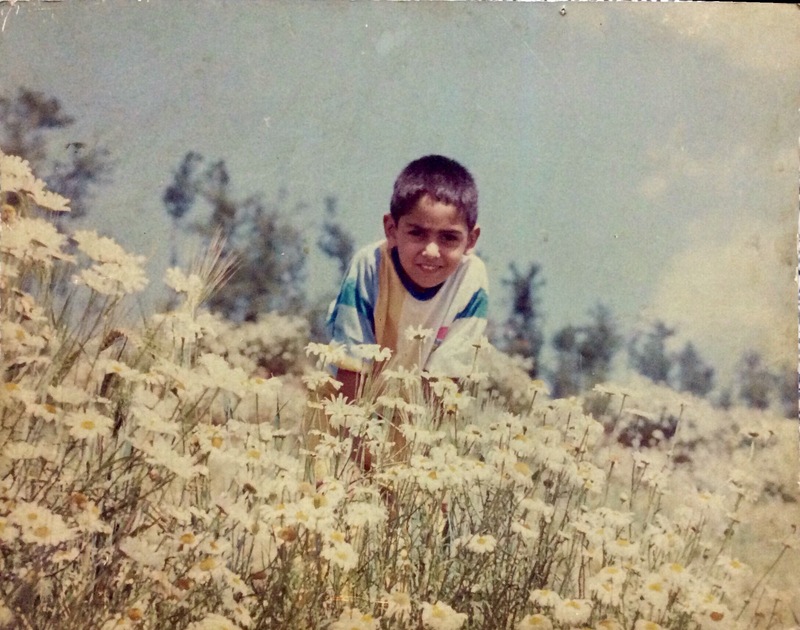 If it was to be the joy of flowers, the only thing that came to mind was this beloved photograph, faded beyond recognition and the negative lost! I made every excuse not to make it. 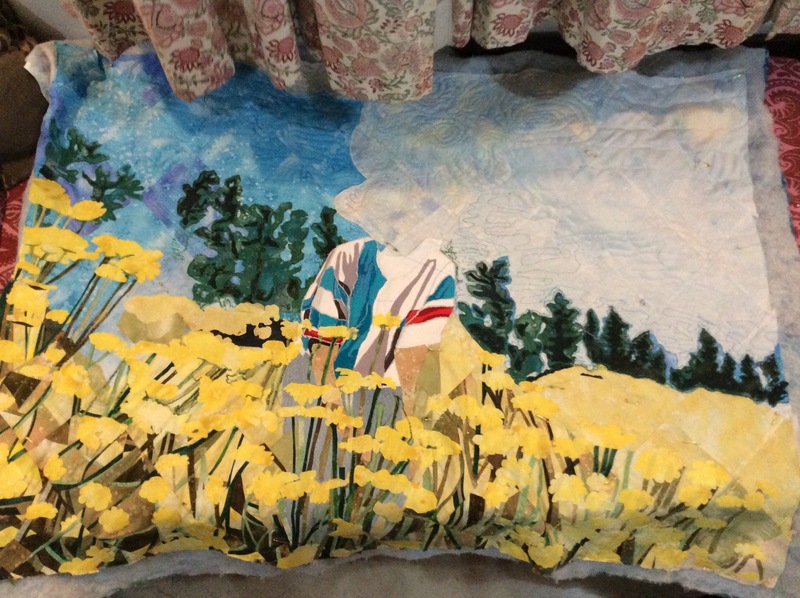 I had no idea how to do an art quilt. I prefer piecing and for the life of me how was I going to piece this? 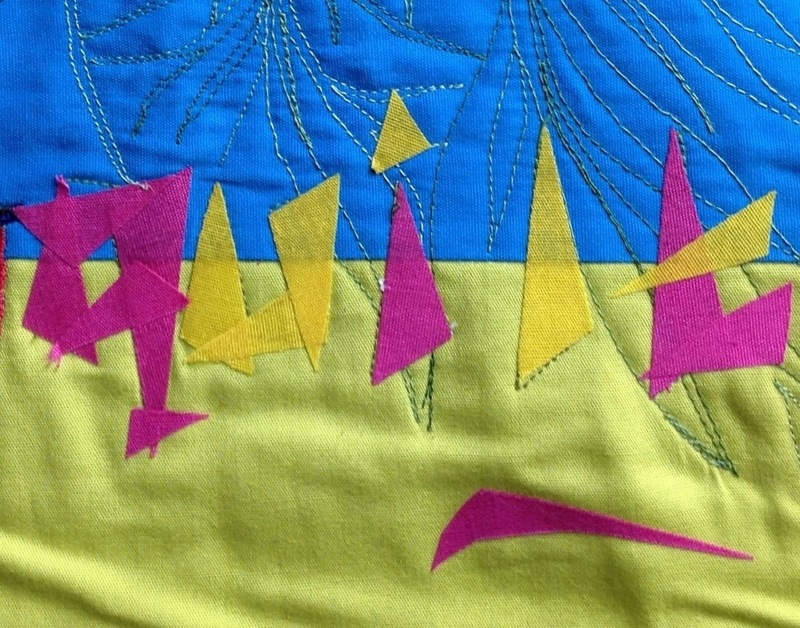 If I had to appliqué, I like only needle turn hand appliqué! Raw edge appliqué is really lazy, isn’t it? And most importantly, where did I have the time? So I propped it up on the table in the spare room and surfed the Internet for ideas for over two months. 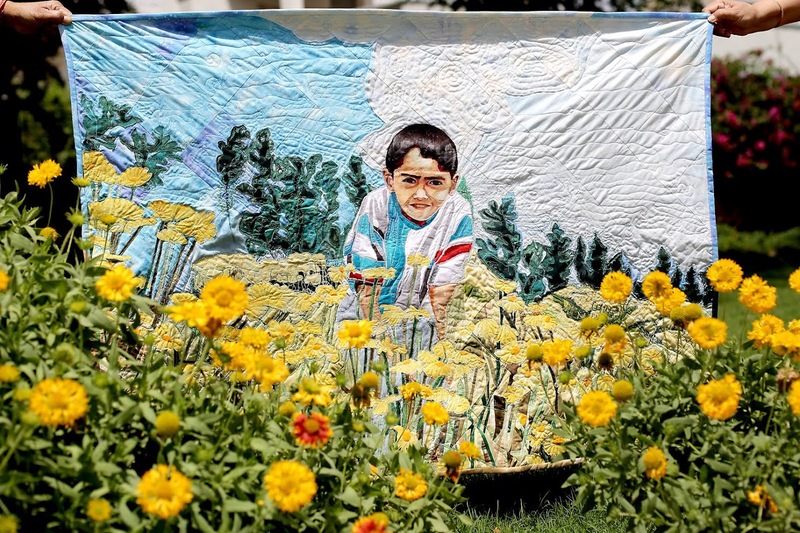 I found hundreds of flower photographs and dozens of exquisitely crafted flower quilts; sadly, none of them called out to me to make anything like them! I obsessed with This Quilt, dreamt of how it would look! I lay awake drawing up and rejecting various techniques for constructing it. 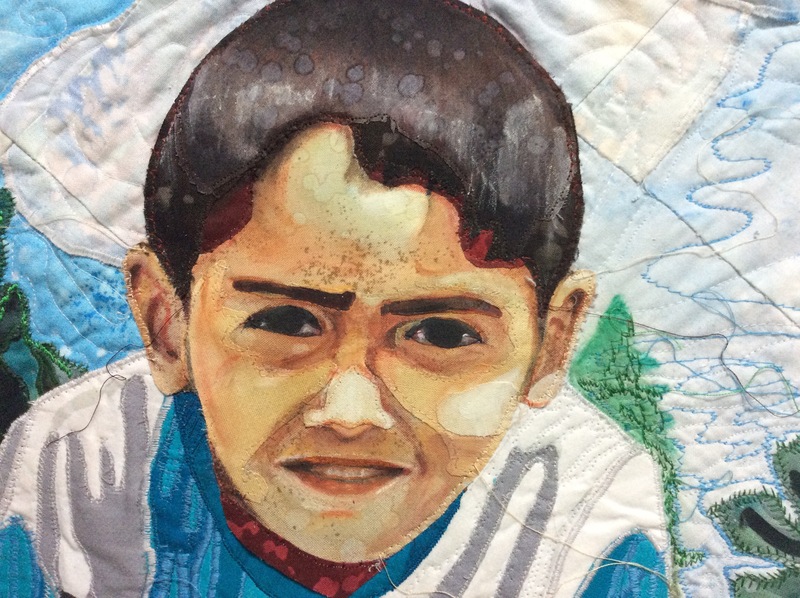 Finally, I knew that I had no option but to venture on what was likely to be a disaster…and started studying portrait quilts. This photograph transports me back almost thirty years. 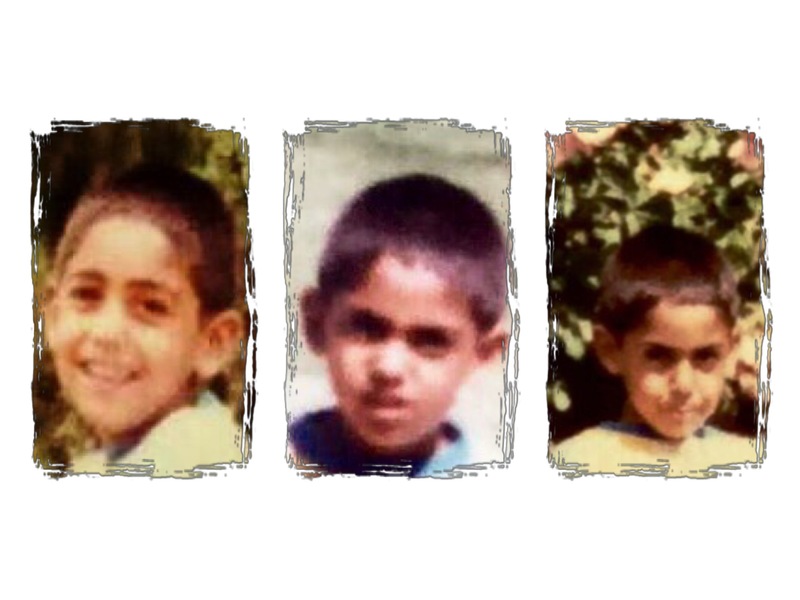 It was our first car, a second hand Maruti 800, and we were on our first trip to the enchanting Simla Hills with our almost–four year old son. 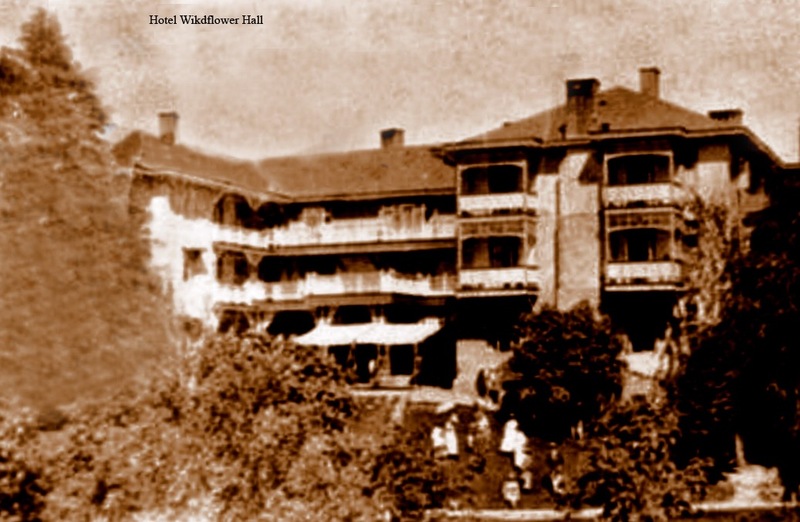 It was in the times when vacations meant a holiday with your grandparents or cousins or even a pilgrimage. 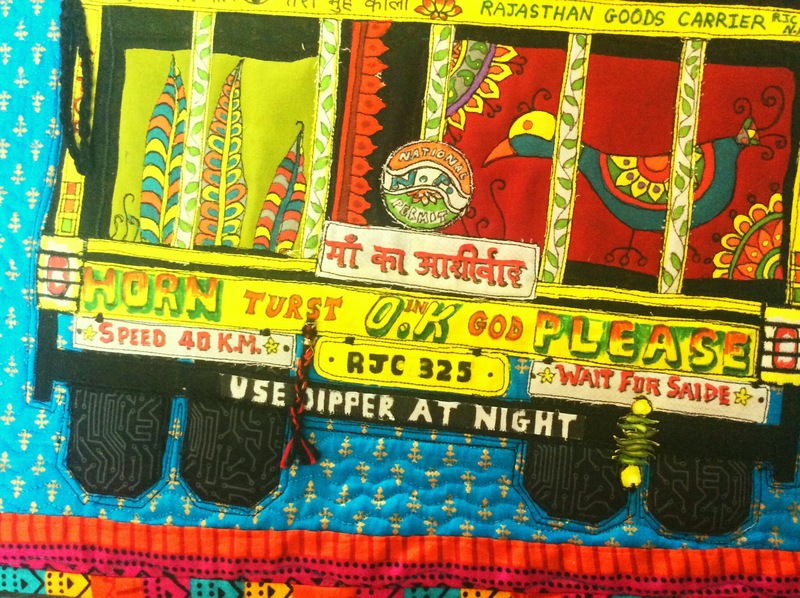 The economical car had just been around for a couple of years; The Great Indian Tourist was yet unborn and the Himalayas were largely untouched by any outsiders but pilgrims. We stopped for the night at almost every other turn of the road, spending the day exploring the area or just lazing around in our hotel, having dinner under the Milky Way so bright that you could almost reach out and touch the stars. 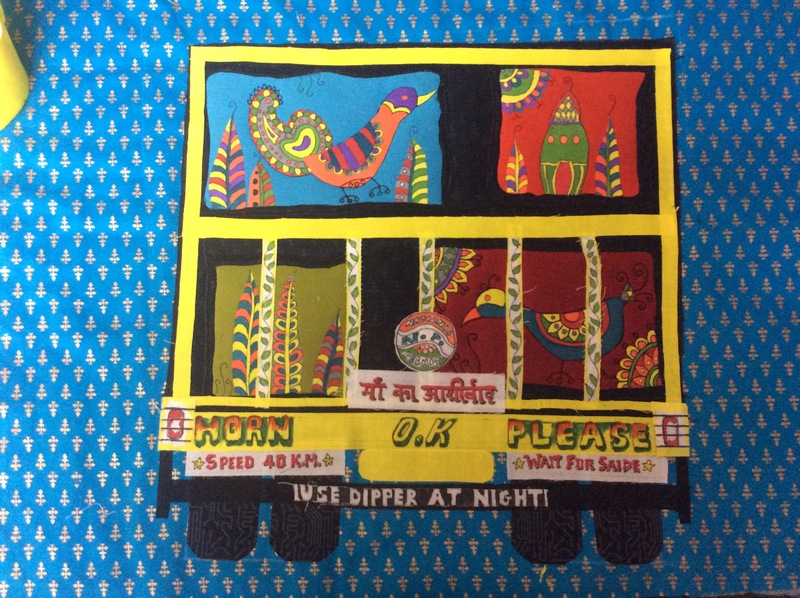 Small settlements – Parwanoo, Kasauli, Barog, Kiarighat, Chail – it took us five days to get to Simla from Chandigarh, a distance of just over a hundred kilometres! We did not care for crowded Simla and travelled further up North to Kufri, Naldera, Narkanda. And then to Mashobra on our way to Wild Flower Hall, an old colonial style palace. There had been flowers in every crevice in the rocks everywhere we went, but in Mashobra the flowers went wild! The hills were covered with white, yellow and lavender. We stopped on the roadside, laughing for no reason but the joy of being alive! Our son ran up the hillside and as he looked down at us, squinting in the bright sunlight, this photograph was taken. 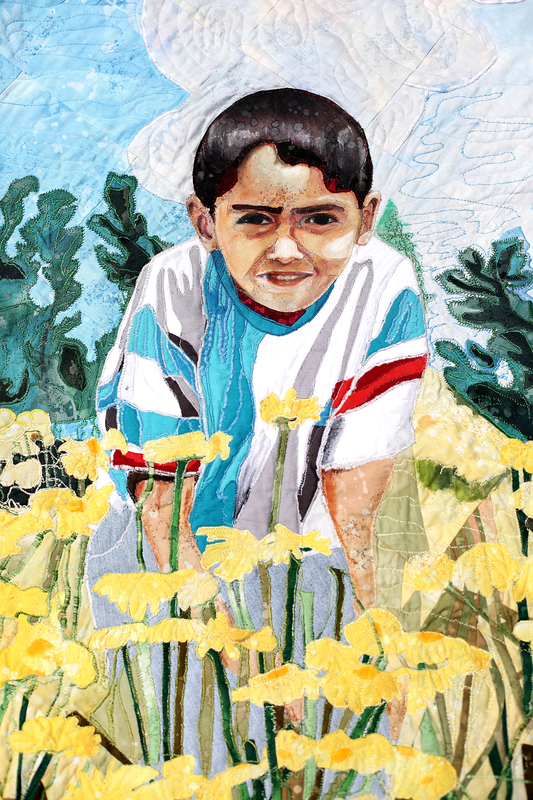 I also dedicate it to Rushu, the best brother in the world, the little boy in this quilt, who has stood by her at every step of the way. I have made a mother’s promise to him also – to make the head (slightly flattened from the top) of this portrait okay. Now that we are though with the competition, I shall get around to doing that. I scanned the photograph and increased size to 36” x 45” approximately. 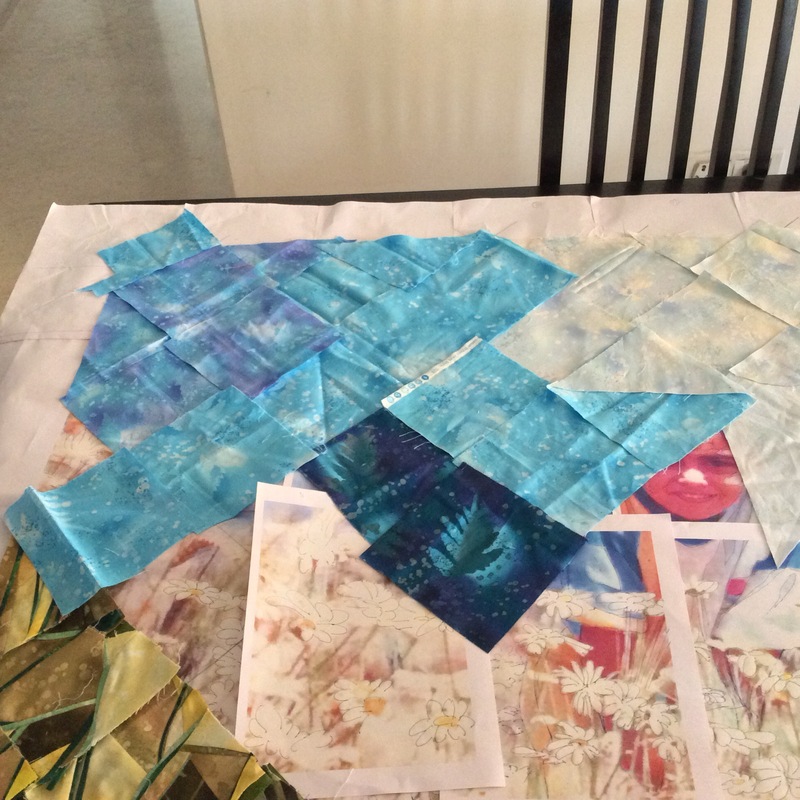 Printed 32 pages through an Excel file and spread them on the dining table to make the template for the quilt. We ate on the sofa for almost two months, except the few times when we had guests and grumbling, I had to shift my stuff to the bed in the guest room. 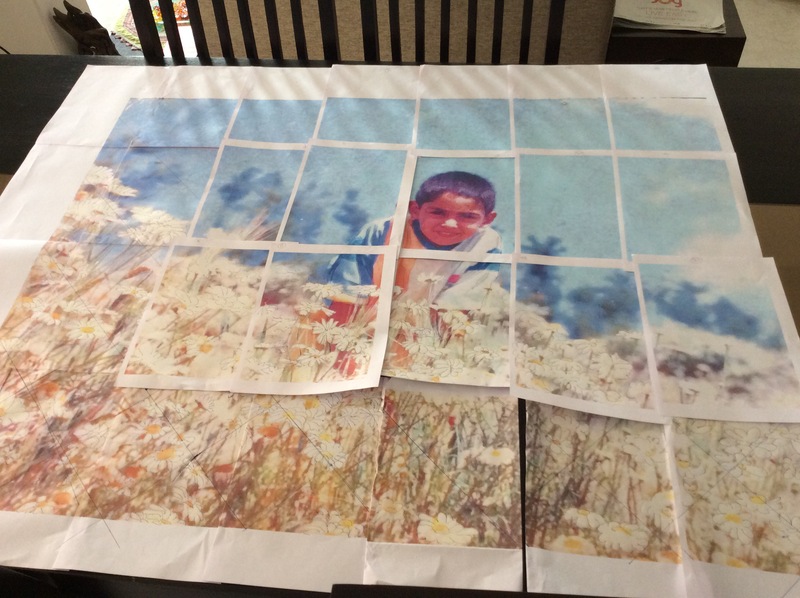 The print out of the enlarged image laid out on the table. This done, I wracked my brains on how to go about the actual piecing/ applique. 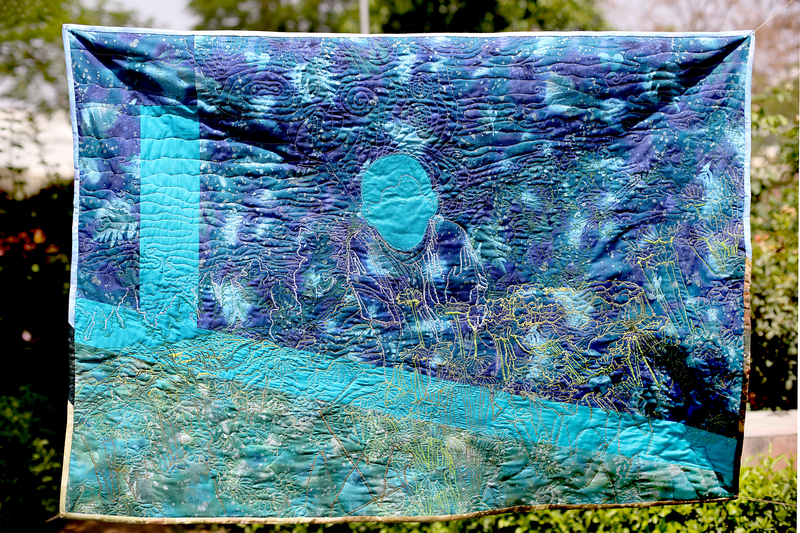 As you can see the bottom half of the quilt required a great deal of work and the top half was open expanse. 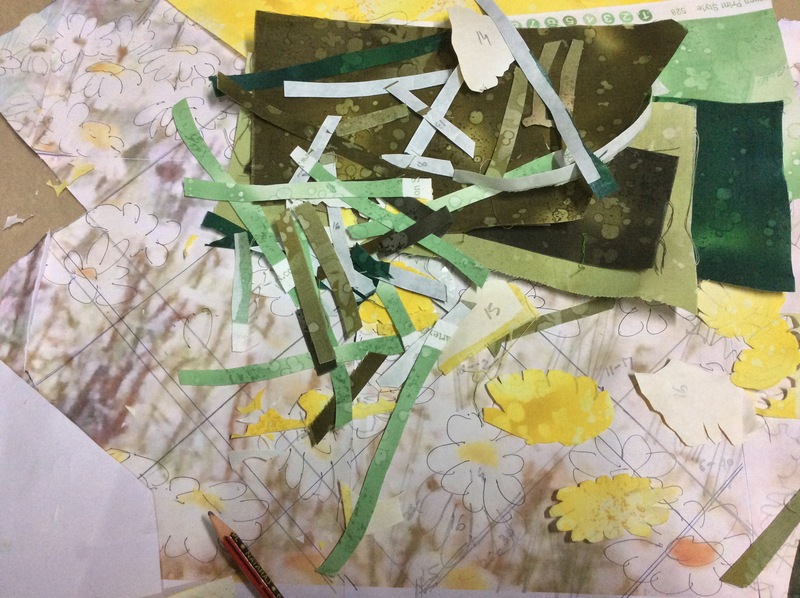 I originally planned to do the boy’s portrait first on a blue background, then just cut up the selection of green and browns (from 12 different delicious fat quarters) into strips, place them randomly to denote the wild riot of foliage and do a fine stippling to hold them in place. The flowers and trees etc would come up last. This did not appeal to me. 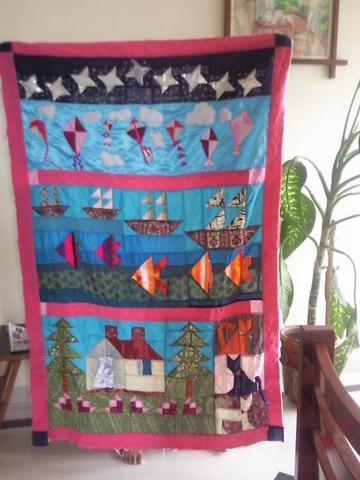 I wanted a `quilty’ quilt. Otherwise I would paint a picture, wouldn’t I? 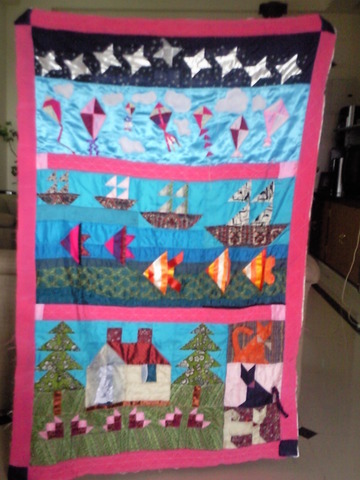 I am more of a ‘piecer’ and raw edge applique did not seem like real quilting to me. These were mere excuses, I think! The real reasons were – my brain understands order better than chaos (those stems and flowers were a senseless riot!). 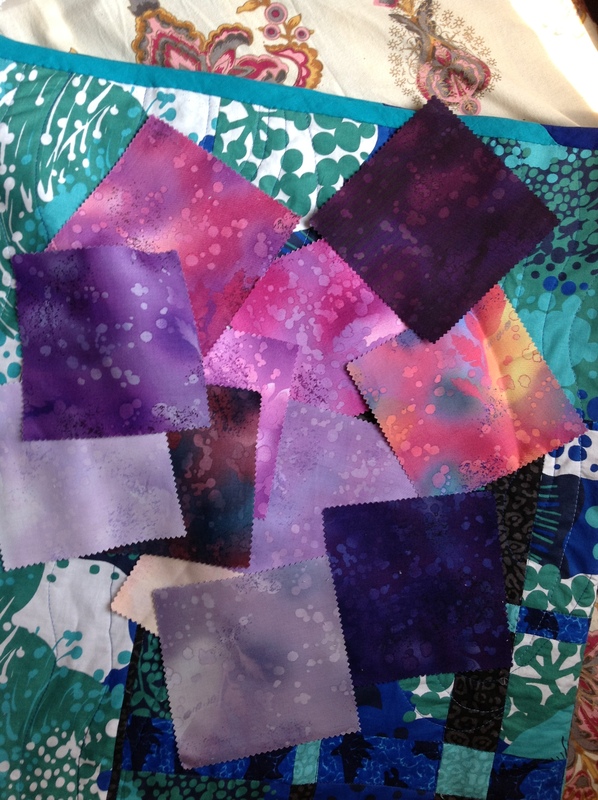 Most of the selected fabric in my stash was in the form of fat quarters. It would be easier to handle reasonable sized blocks. 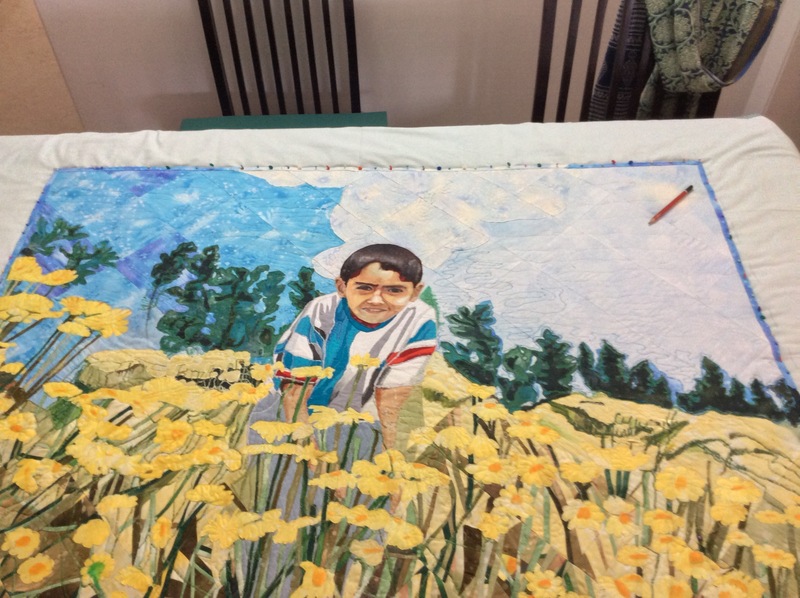 This meant, roughly, that I would get the background ready first, make the portrait separately and applique it on top of the background and then add flowers and stems as necessary. 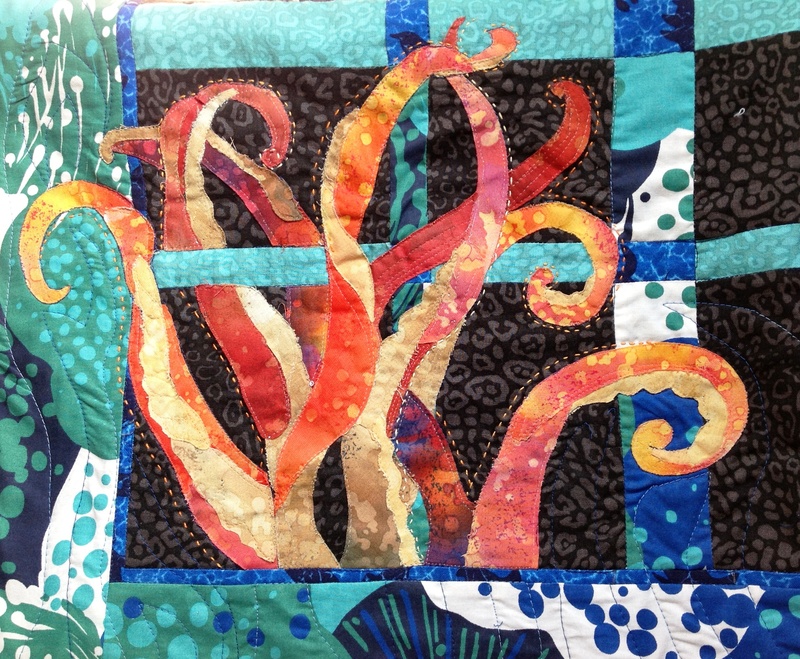 For the background, I decided to adapt a technique taught by Wendy Saclier in a workshop for crazy quilting published in ‘Quiltskills – Workshops from the Quilters’ Guild, Australia’ by The Patchwork Place. I would piece the quilt in the form of a grid of 5” squares set on point. 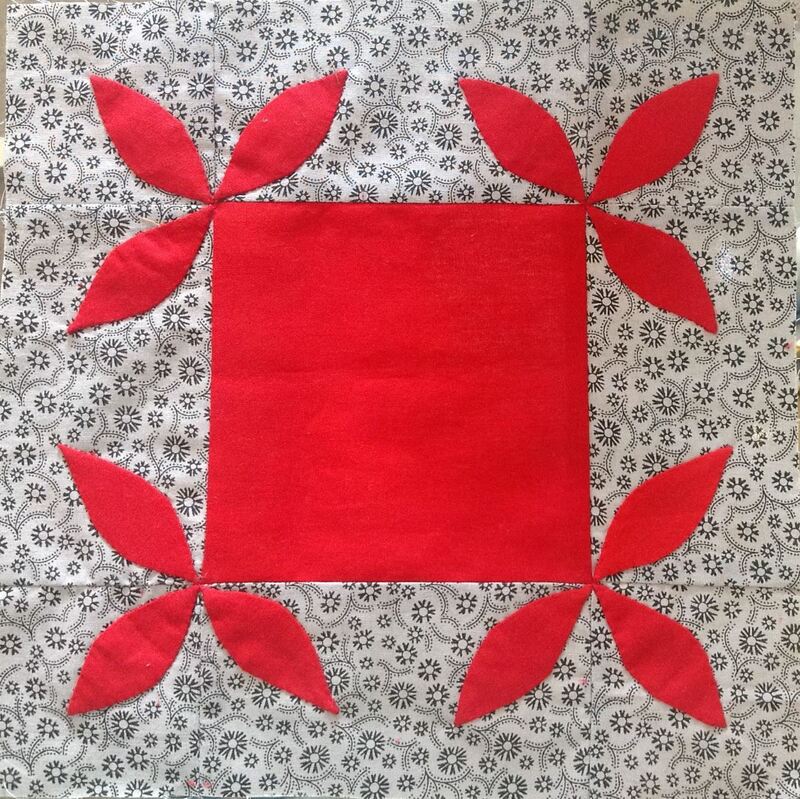 The quilt would have a 7 x 5 grid plus the setting triangles; the next step was to mark the grid. I had to increase the width of the picture to accommodate the full squares. Another creative decision ( sounds very important, doesn’t it?) 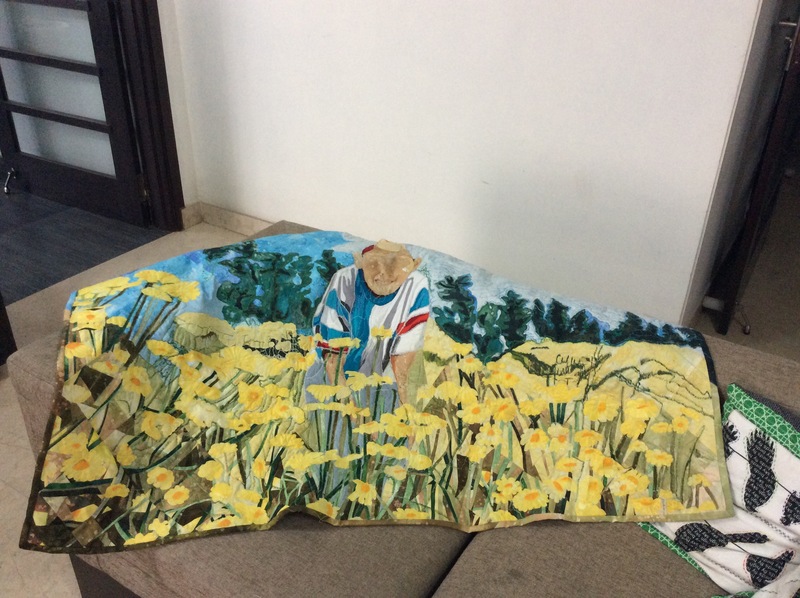 was to change the colour of the flowers to yellow from white. The colour of the shirt which was gold, blue and white would then have red instead of the yellow, and the trousers blue instead of yellow! I cut foundation pieces in green fabric started the piecing from the left bottom corner. I was not following the picture exactly, just a sense of the direction in which the plants are leaning, the foliage clearing up and the colours lightening as you move from left to the right. 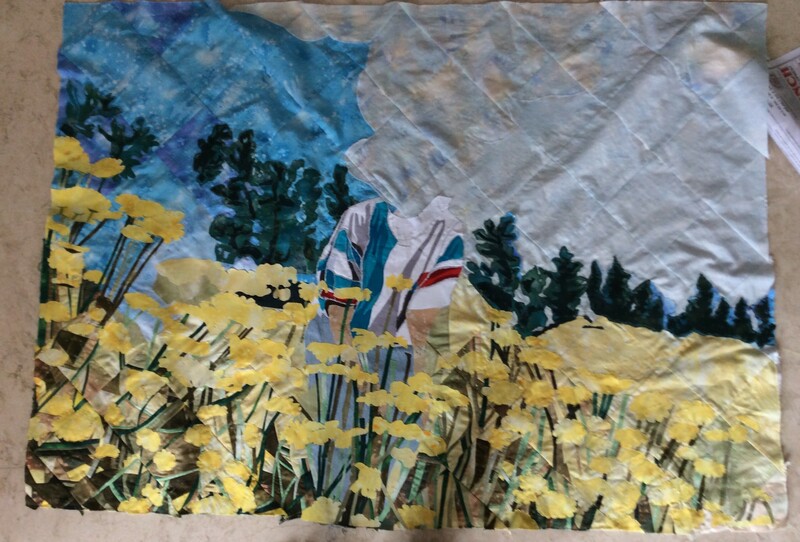 I also used larger pieces of fabric towards the top and to the right, to emphasize the feeling of ‘openness’. An additional problem was that the stems were not only vertical, but horizontal and slanting too. The foundation piecing was basically, therefore, improvised, just lightly marking the strip direction on fabric with a pencil. Much as I loved this challenge and the results, each block took ages to grow. Beautiful, but the criss crossing stems took ages to piece . 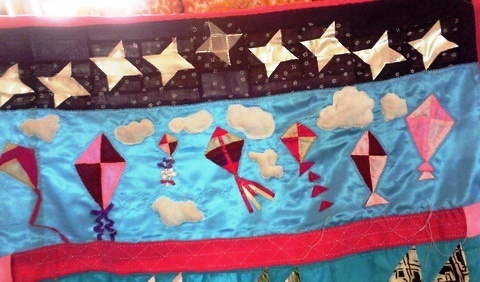 Skipped to the sky after seven days and only one corner completed in the desire to see the quilt come up faster. I posterized the picture ( Used Microsoft Office Paint to reduce the number of colours), took an A4 sized print out and used that as a guide for colours, which were not too clear in the enlarged poster. 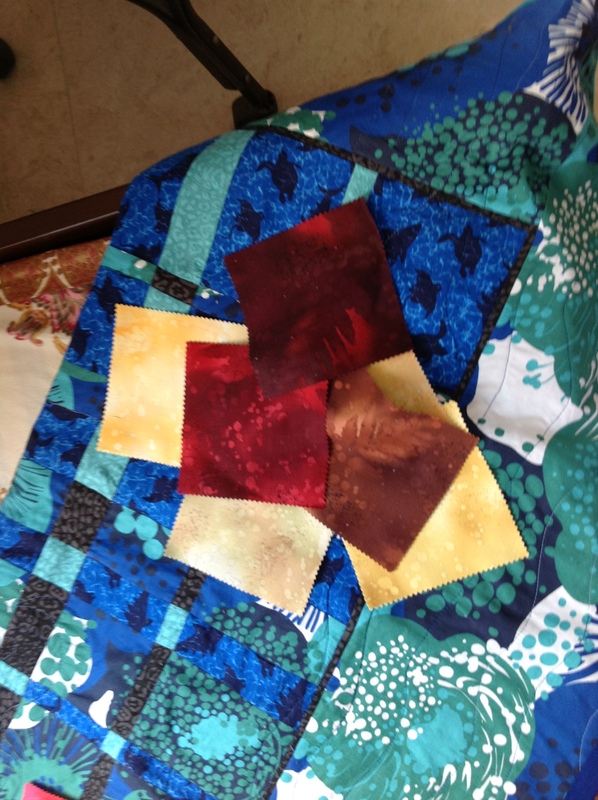 This was a trick I picked up from Marilyn Lee, master art quilter, who is generous enough to hold free classes on Facebook. 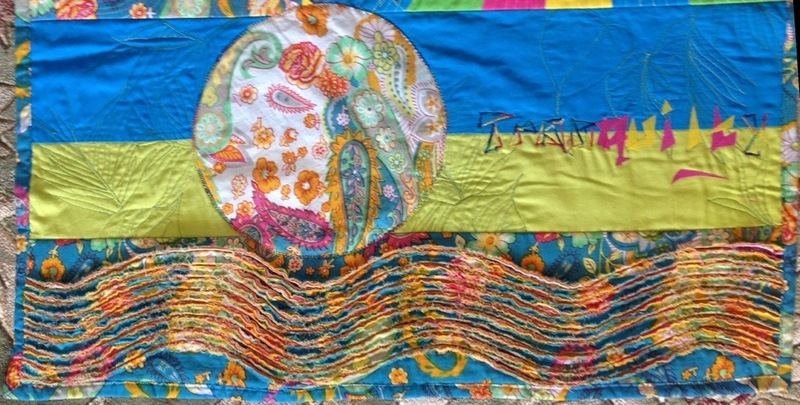 Check out her `Classy Quilts : The Art of the Art Quilt’ page. I only wish I had found her a bit earlier than I did. The colours were all wrong in the enlarged picture. Something needed to be done! Half the top plus pieced in a couple of hours! Back to the lighter foliage on the right bottom corner. Much faster and piecing part of top almost done. Then moved to the left, to start the work on the background this side. Running out of fabric, had to paint fabric for a few squares on the left. 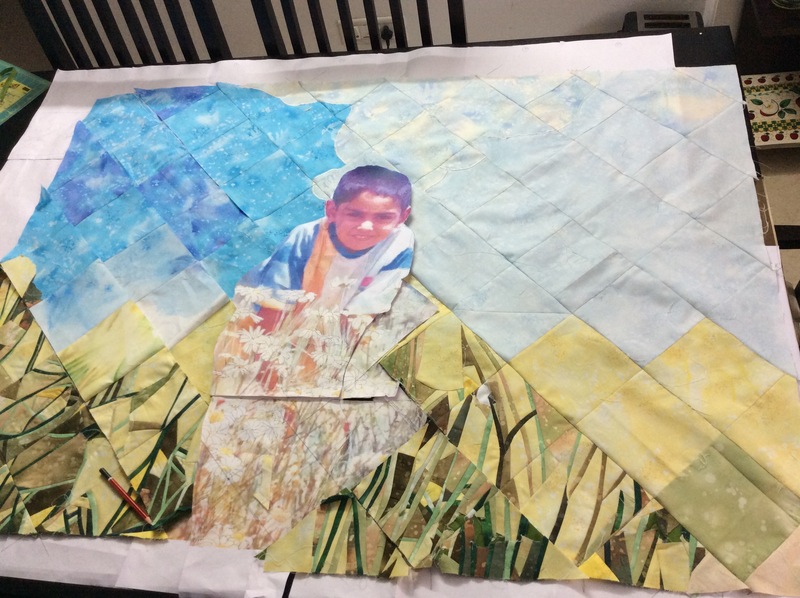 Left the centre panel, where the boy is half crouching, un`blocked’. 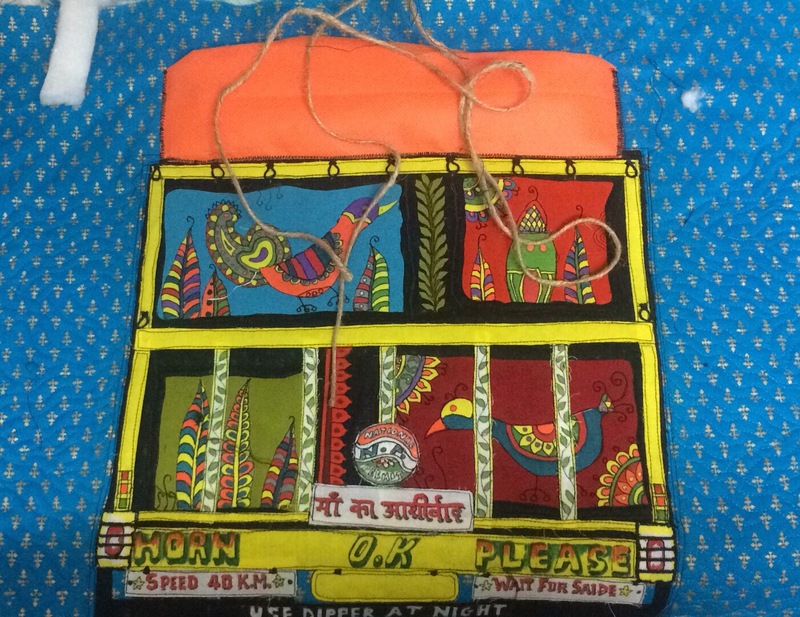 Top background done, time to paint … er…appliqué on it. I used a combination of fabric fusing and sewable stabilizer to appliqué. The trees in the background came up first. 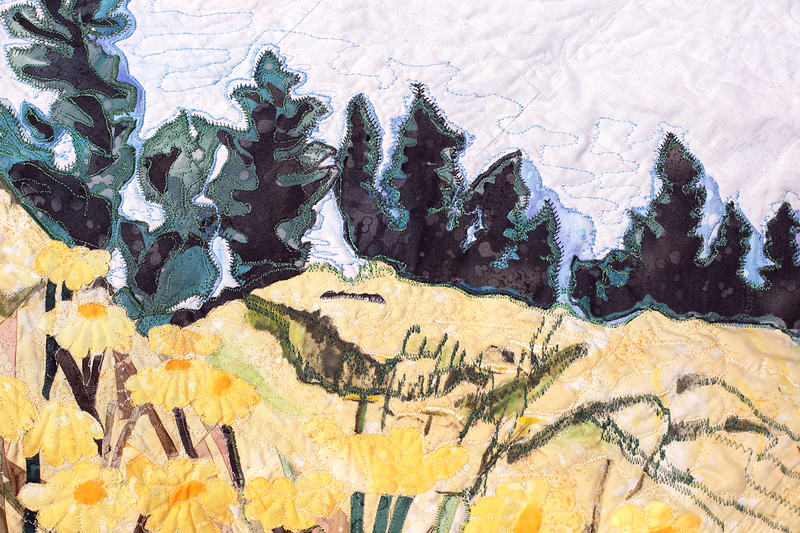 I used the fern stitch on my machine to sew them to the background, to mimic the look of pine needles. 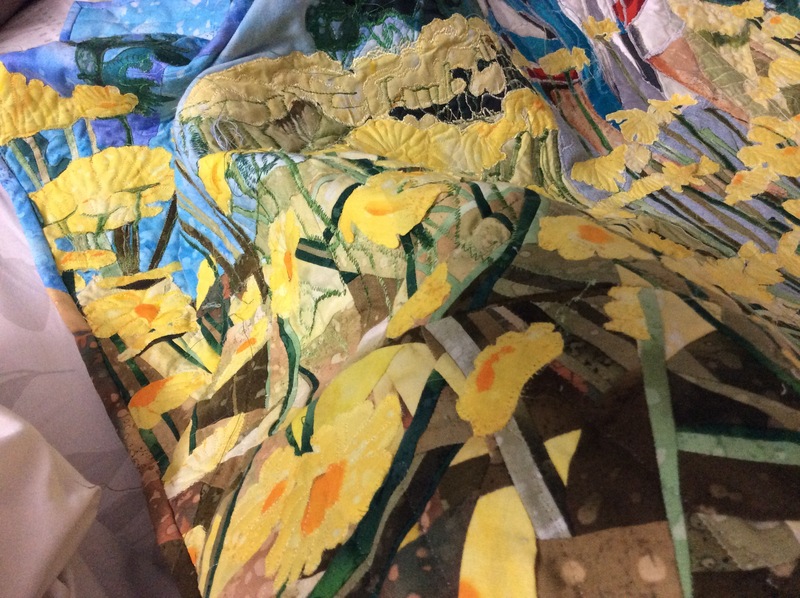 By the time this quilt was completed, the `unsewable’ fusing on the darker fabric had started peeling off and had to be sewn back in place. The greenery on the distant hillside on the right came off altogether, and I had to paint and quilt in that area! Meanwhile, we had only 3 weeks left for the deadline. So I made the backing, before starting on further applique. The amount of applique would depend on how much time I had at hand! The backing used the only matching yardage in my stash. 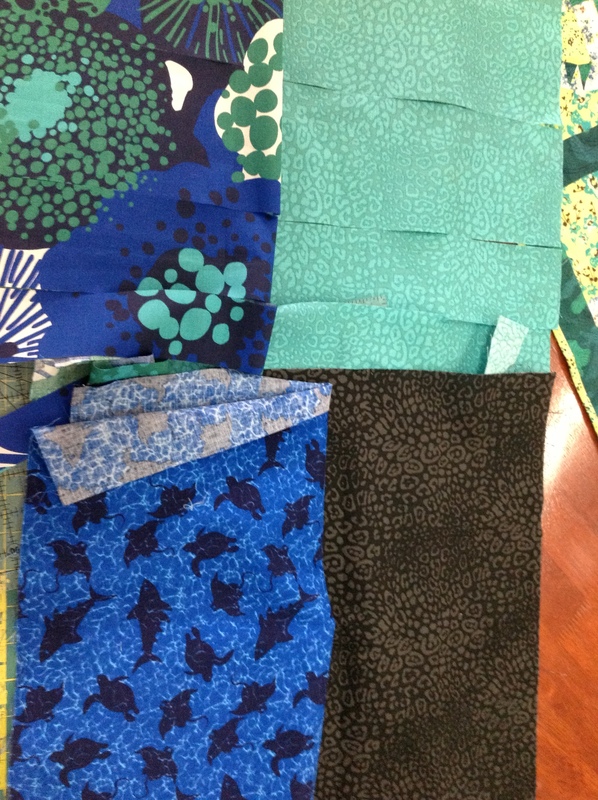 I wanted to emphasize the `slope’ hence added a solid to separate the two main fabrics. 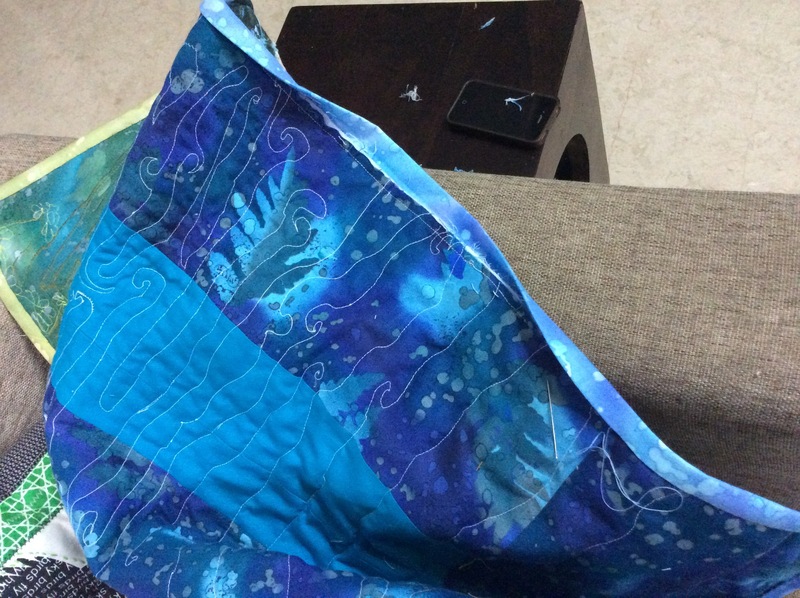 I discovered that the slope had been cut in the wrong direction, but I did not have fabric to re- do it and eventually, it really did not matter! I cut and sewed a piece of denim from my old jeans for the trousers in place on the background. 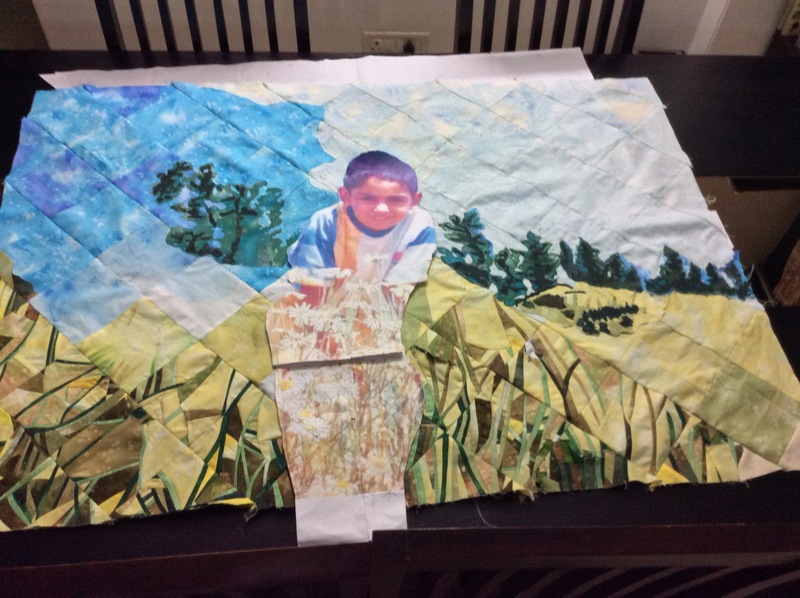 The boy’s torso was built up separately on white fabric, to be joined to the main quilt top through quilting. Finally seems to be getting somewhere! The trees are in place; the figure is ready to be built up. 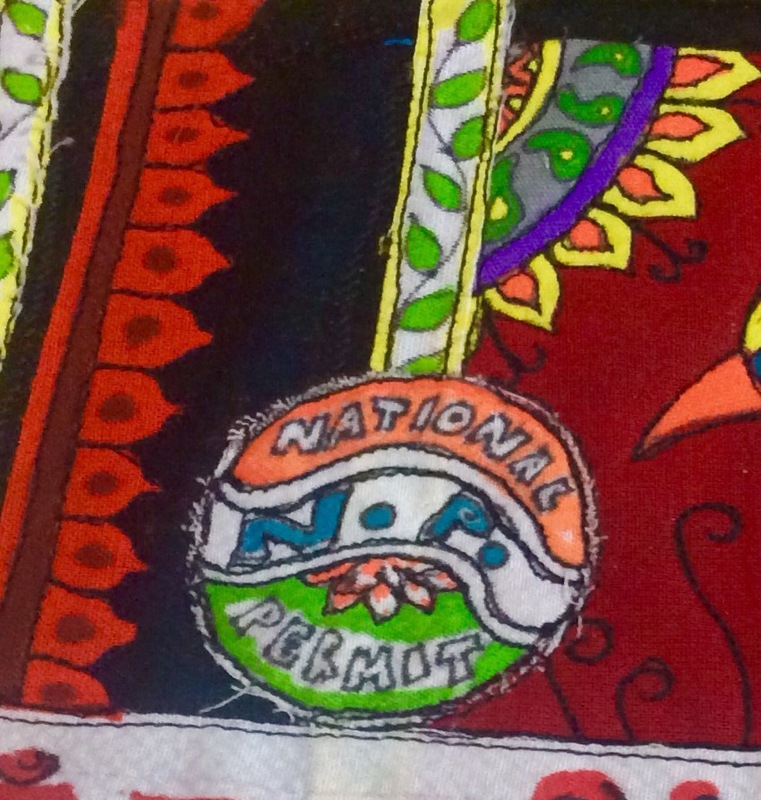 Here is a close up of the shirt completed. The shirt – I marked out the colour separation and cut out the paper template torso into pieces. 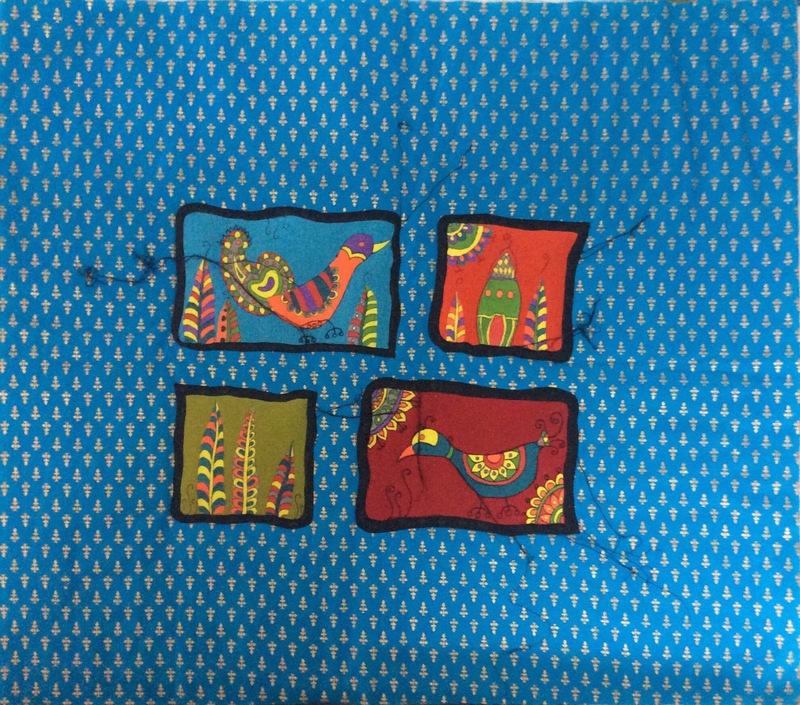 Traced these on to Heat n Bond backed fabric of matching colour. Placed it on shirt outline, fused and stitched. 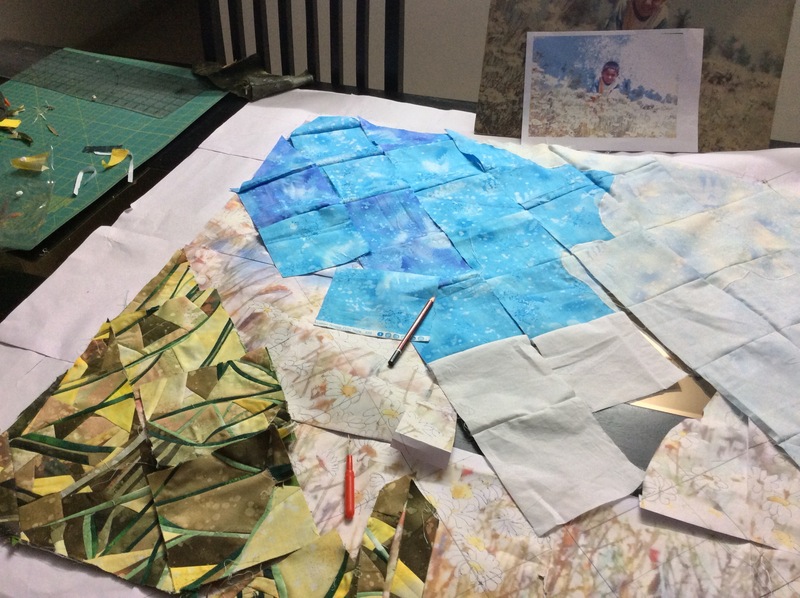 Now to start on the dozens and dozens of flowers and stems…Once the trees were in place, I cut out dozens of flowers and stems of all lengths and widths from 1/8″ to 1/3″ approximately. I was first numbering them, following the template poster, but very soon realized the futility of it and gave that up! Initially, the stems and leaves were labelled with corresponding numbers on the giant printed poster. After covering 10 square inches and 40 stems, I gave up. I used a zigzag stitch for most of the appliqué, as it best resembled the movement of a pencil across paper, when ‘shading’. To emphasize a 3-D effect, I sewed the stems down with invisible thread on one side and a contrast colour thread on the other. The flowers were also stitched down at the edges with invisible thread, the separation of petals was done with yellow rayon thread later. Halfway through, I made the cardinal error of adding a stabilizer to the top to facilitate the appliqué. This would prove really troublesome when quilting. 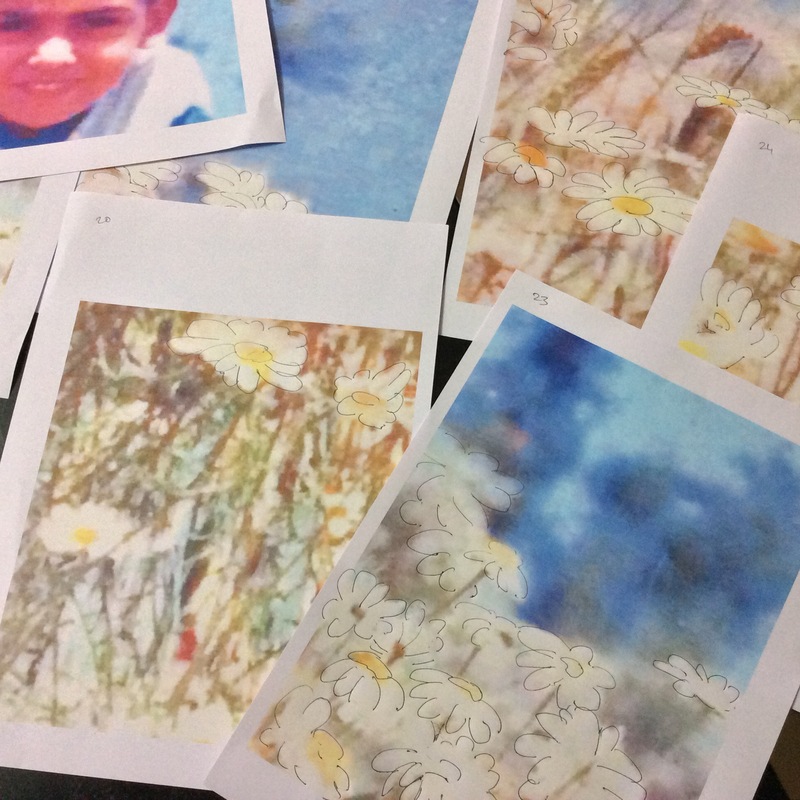 I left only the uppermost layer of flowers and the boy’s arms and head undone. 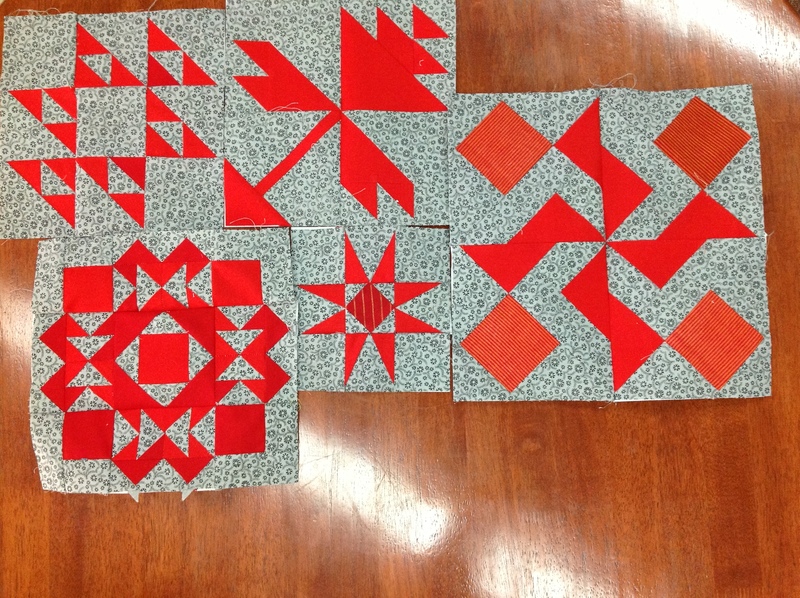 They would be sewed / attached during and after the quilting. Finally ready to layer the top with the batting and backing and start quilting! 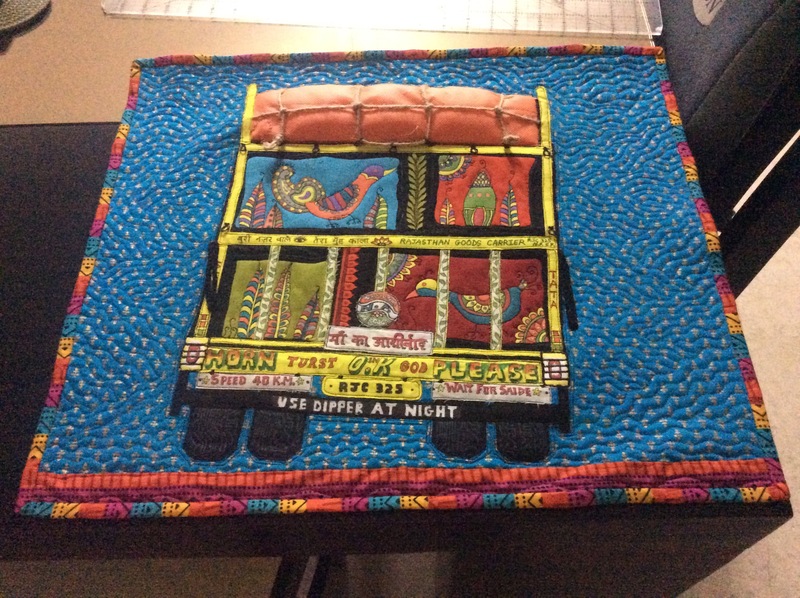 The quilting was tough literally and figuratively. The various layers of one sided interfacing, that I had used as stabiliser, made the top stiff and the needle gummed up. To add to my misery, I had spray basted the sandwich! Till I was forced to peel off the top and cut away the layer of stabilizer where I could. 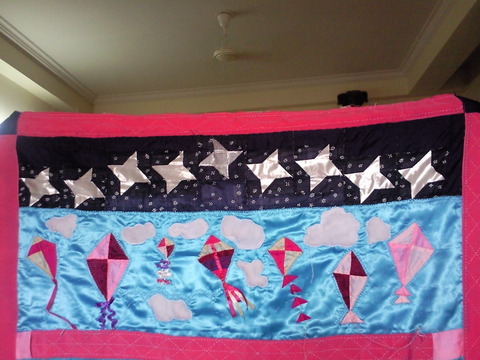 It was so difficult to sew in some parts that at one stage, I actually flung the quilt on the floor in despair. I had tiny holes in the fabric, especially where I was using invisible thread. ( Spraying them with water removed those later, but right then they were really scary). I changed to a smaller sized needle and that seemed to work better. 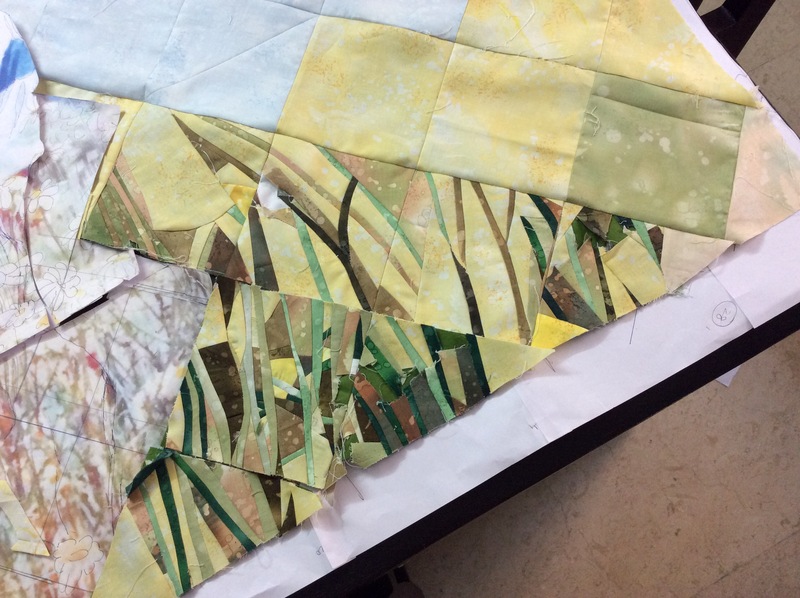 I used a close zigzag stitch / satin stitch in most places in the foliage area to quilt stems which would hold the layers together. For the sky, I used a regular straight stitch and zigzag stitch. I considered attaching the orange flower centres with applique, but scrapped the idea, because they would stand out in strong contrast, detracting from the whole picture. Inktense pencils were used instead. 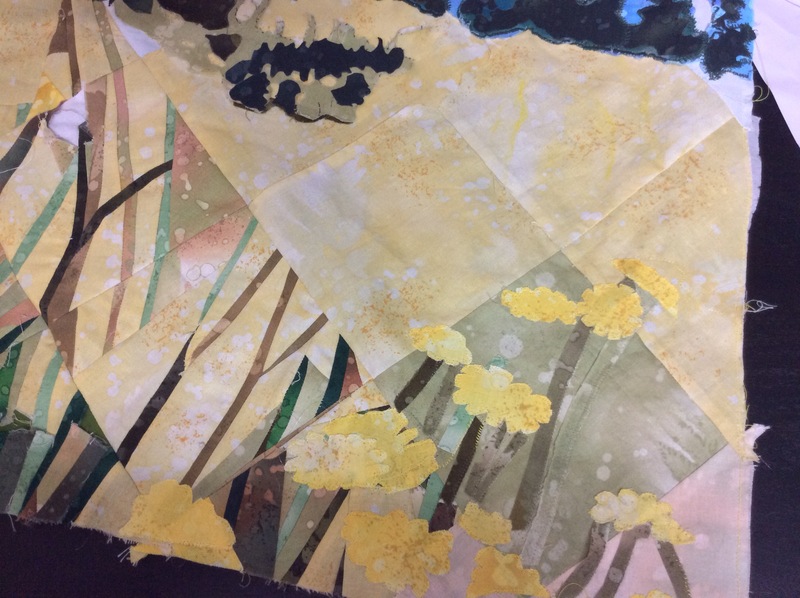 I also used them to add depth and greenery to the distant hillside, as the adhesive had come off the raw edge applique done with non sewable Heat n Bond. The arms were similarly shaded, I did not have fabric the right colour. Burying the threads took a full day as I used 3 blues, 5 greens and 4 yellows for the quilting. I was running out of time and the head had been giving me several problems right from the beginning. 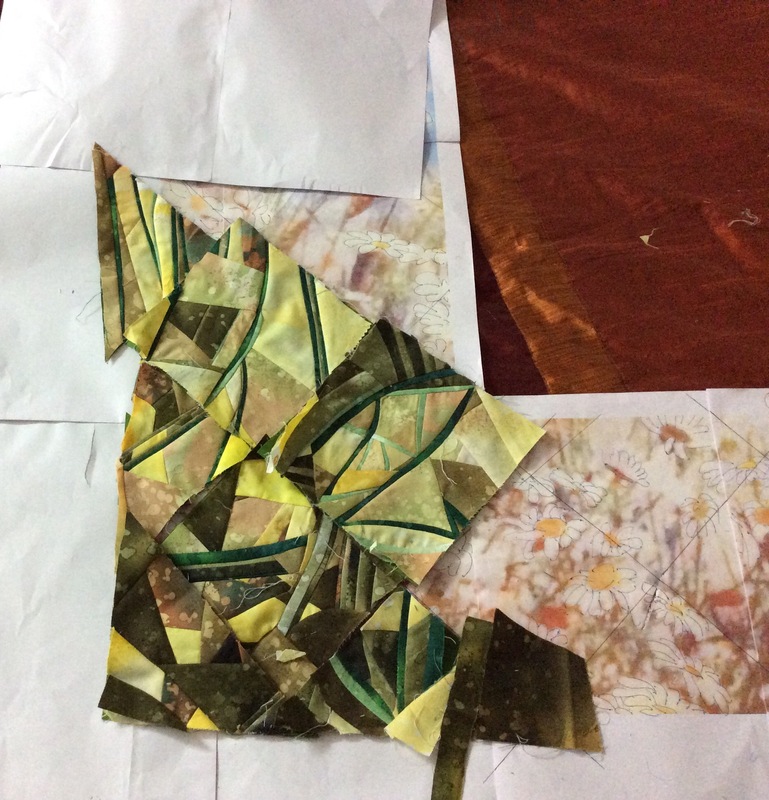 I had posterized the face to obtain a clear demarcation of colour to help in the patchwork. The eye portion stood out like two black holes against a pink face! I made up and scrapped two faces and the arms as they were too pink and looked nothing like my son. Now I scanned several photographs to get the right colours. I enlarged and studied several photos to get the face and colouring right. I finally found four fabrics in my stash which I could use for the face; I worked directly from the original photo instead of the print out. Nevertheless, whatever I did, the colour of the lips posed a problem. I even considered leaving the face blank, but it would not work with so many details in the other areas. I attached the cut out for the face; got the eyes, eyebrows, forehead, cheeks, nose, ears, neck and the neckline of the t-shirt ready separately to be built on it. The lips would be done with Inktense pencils! Leaving things where they were, I did the binding now; seven different fabrics in greens and browns were used for the ‘land’ area and three blues for the ‘sky’ area. It was machined from the front and hand sewn at the back. This was the most relaxing part of the entire quilt making. Binding machined from the front and hand-sewn on the back. I am verrry proud of the binding;! I finally tried to sew the face parts, but the face area was too stiff to be stitched on. I had no choice but to rip it off. 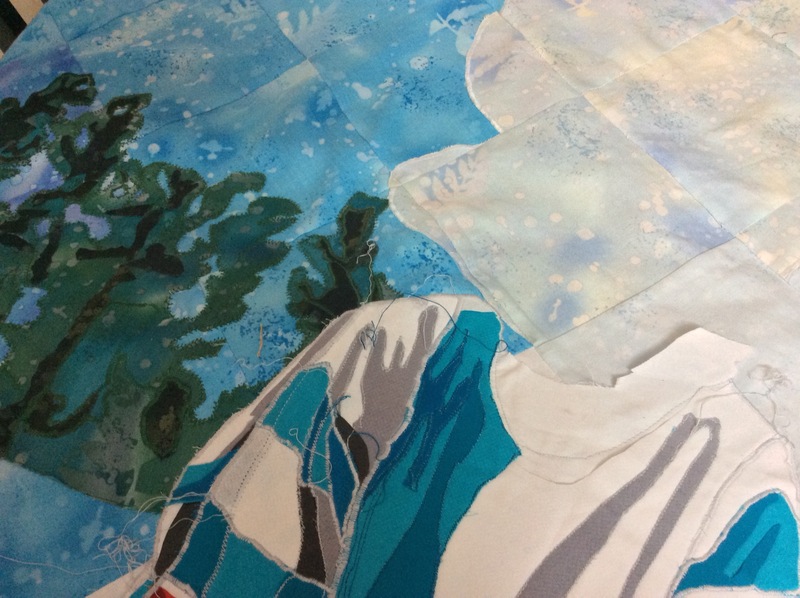 In the process of removing the face, I was ready to burst into tears as I made a cut in the backing fabric!. That is when I had the brilliant idea of attaching a ‘head’ to the back, to cover up the cut! I did the face anew, again using the original picture as the guide. I built it on freezer paper, which could be peeled and ripped off after stitching. This seemed to me much more satisfactory than using adhesive or stabilizer. I wish I had taken photographs but I was hard pressed for time! As mentioned earlier, I had only 4 fabrics in the correct skin tones so used Derwent Inktense pencils to give the face a more realistic look and merge the areas where two fabrics met. 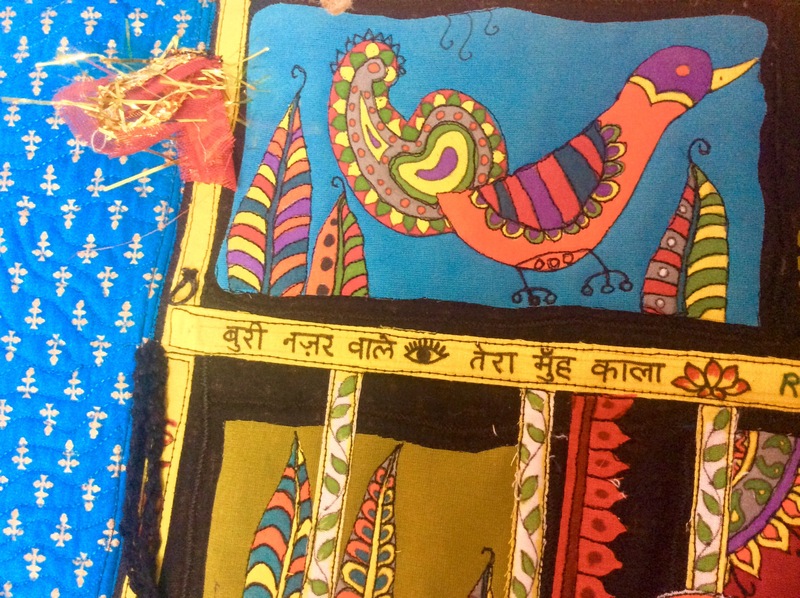 The eyebrows, eyes and neck had to be fused as I could not appliqué the tiny bits. (I have painted under them in case they decide to fall off). 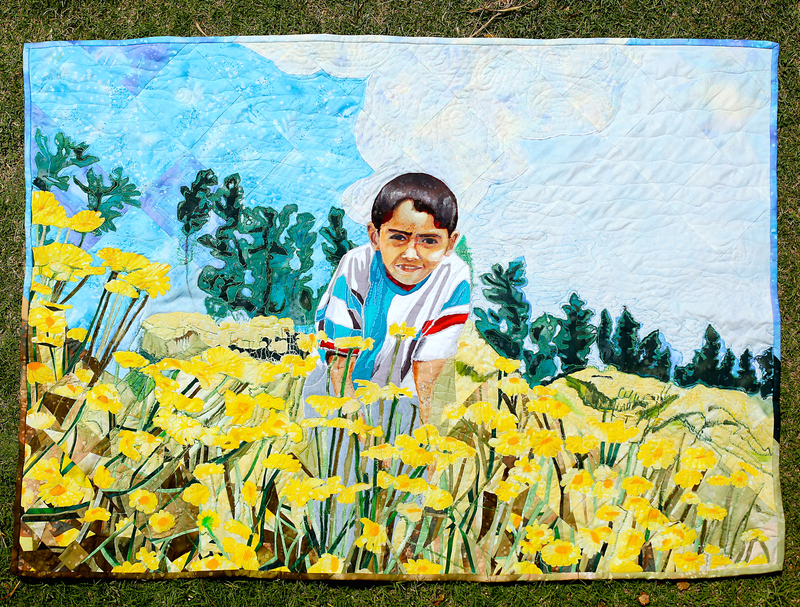 The completed face was attached to the quilt top from the edges. When I stepped back to look at the quilt, there were areas which needed a touch or two, for which the Inktense came in use again. I skipped the sleeve as this will be framed under glass to protect it from the dust in this part of the world. Cleaning up of the quilt for threads and blocking it on a mattress with a sheet on top of the dining table. 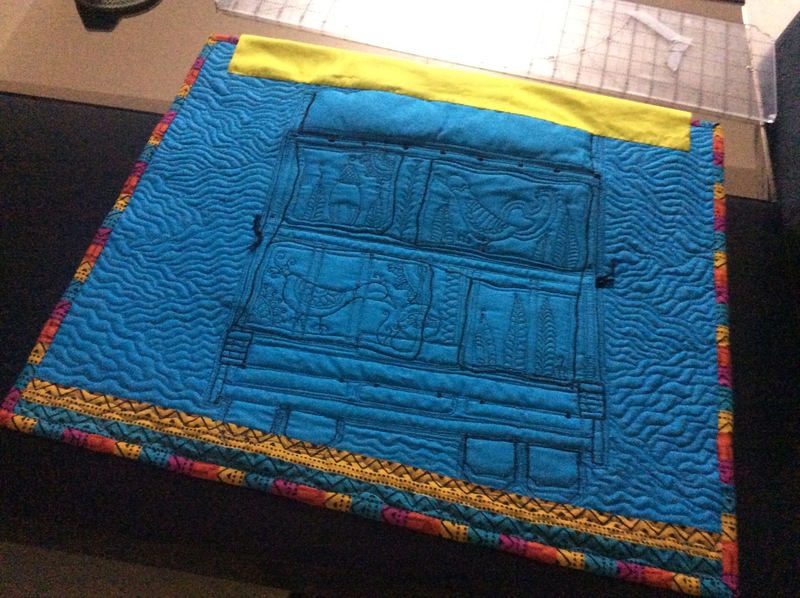 I drew lines on the sheet and used a spray bottle to spray the quilt liberally with water; stretched it with pins at a distance of about 2″ on the lines and left it overnight. The rebellious areas had to be steamed into obedience with a steam iron held about an inch above the top. Finally, the photography session. 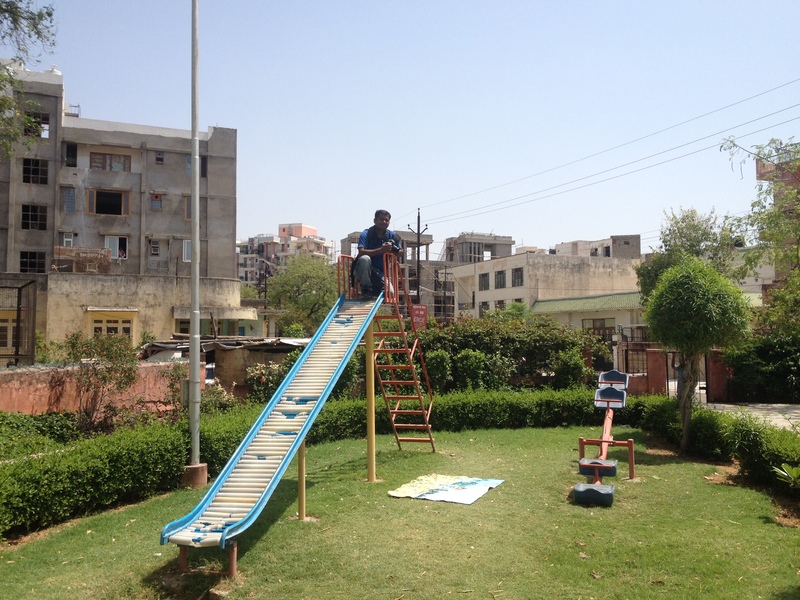 Including one of my photographer, who climbed a playground slide to snap a pic from high ground. Here are all the pictures taken by the professional photographer. If you open these in a separate window, you should be able to see all the details. Do let me know if you have any questions on the techniques and methods! 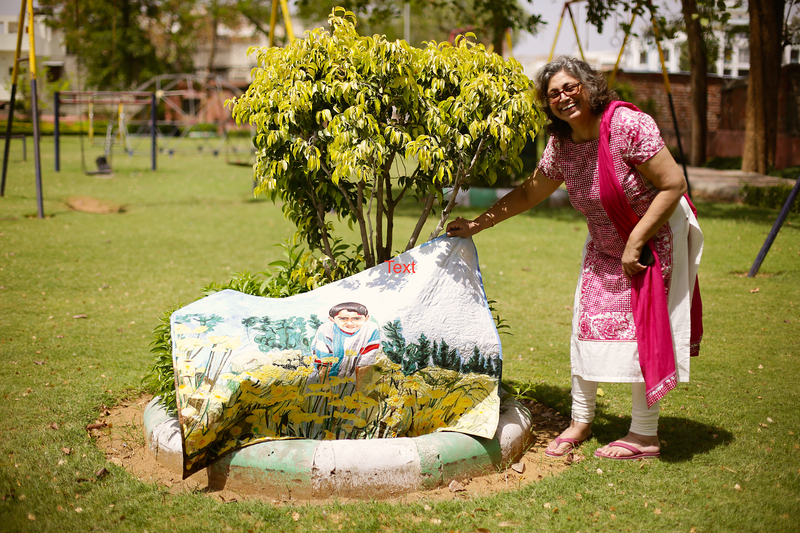 Rushu and me – posing with the quilt! Close Up Trees – The colours are not quite right in the professionally taken pics! 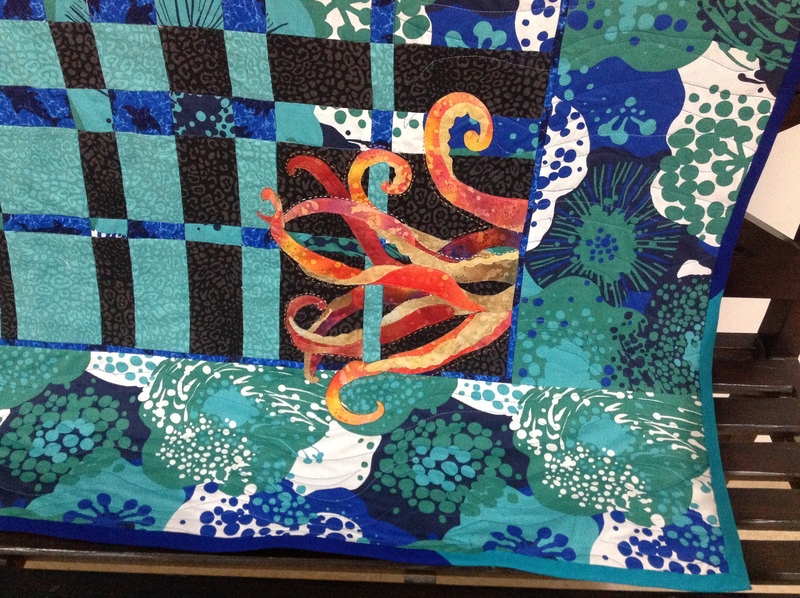 …and the most beloved area of my quilt! End of story: I repeat myself. Not the most technically perfect quilt I have made, but I love it! This is a hand appliqué method that works best when doing patterns that involve multiple curves and reverse appliqué. 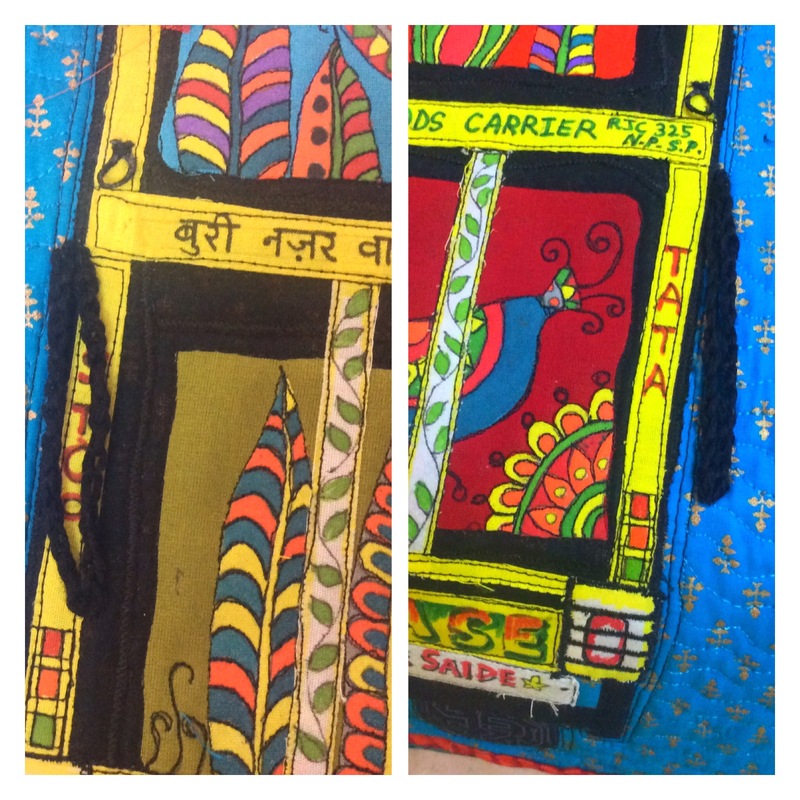 It is a carry with you project – no tedious ironing, templates, freezer paper , glue, pins…It is also very accurate! Pattern – . As a beginner, you may want to choose something that does not have too many sharp curves. A simple pattern with not too many small pieces is a good idea! Background fabric – Most patterns will give you details of how much fabric you will need. But remember – at least ¾” to one inch larger than finished piece/ block on each side. For a 10″ X 10″ block, take background fabric 11 1/2″ to 12″ square. Trust me, you will not regret it! Small, sharp scissors. Special appliqué scissors are also available! Small sharp fine needles – keeping a couple of extra needles threaded is always a great idea when doing hand sewing of any kind. Toothpicks (yes!). A knitting needle may prove useful for some patterns! Couple of sharpened ordinary lead pencils, or washable ink pens for fabric. You may want a white/ light coloured pencil/ pen if your fabric is dark. 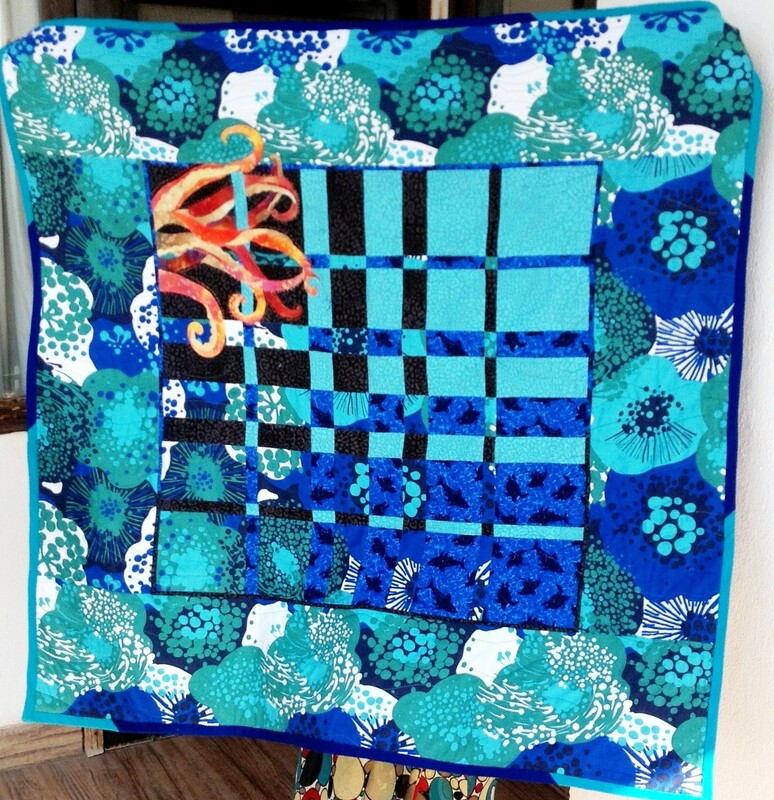 I shall be showing different blocks through this entire quilt along, so please do not get confused L! 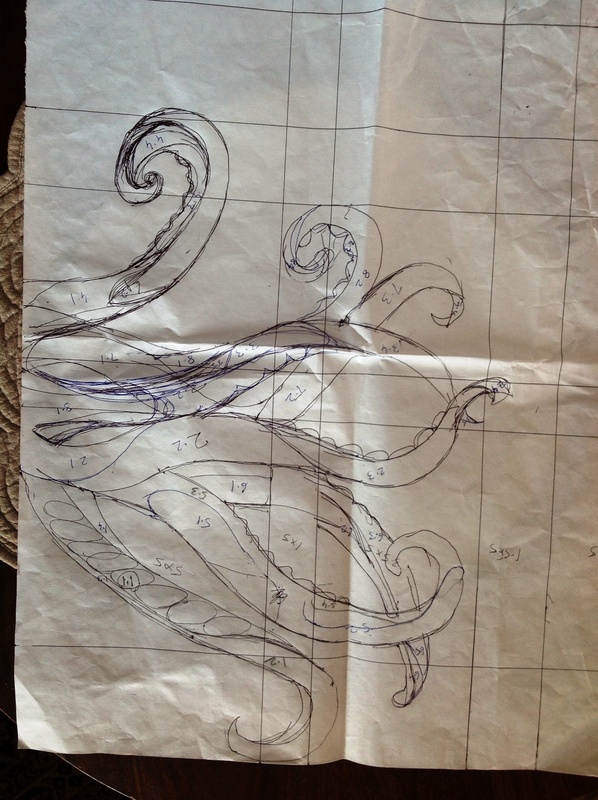 Print out or trace out your paper pattern . You may need to tape together the sheets – matching given dashes or dotted lines – if the pattern is larger than A4 (like here). The online patterns usually carry instructions on how to go about it! This pattern is all taped together and ready to be used. If your pattern is symmetrical – like the one above, you need to mark the centre of the pattern. Trace the pattern to the wrong side of the background fabric. 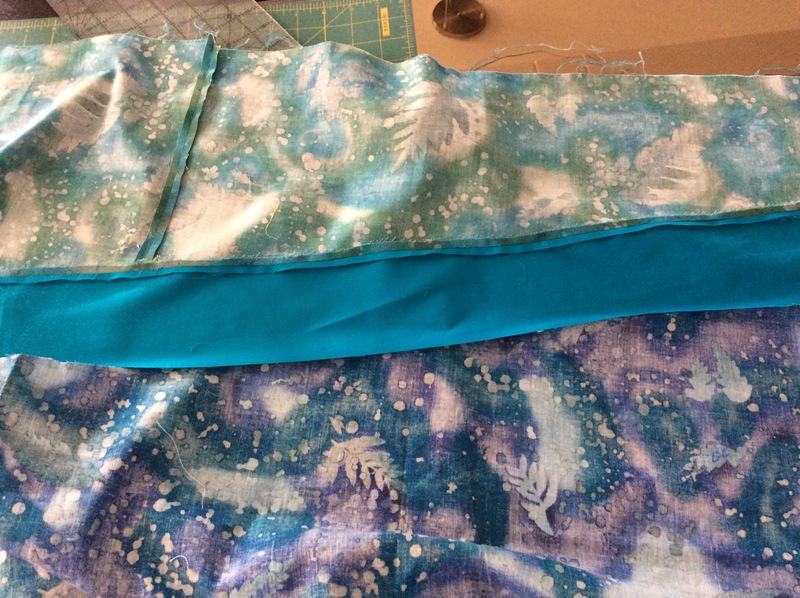 Preparing the fabric: Take background fabric at least ¾” to an inch larger than your finished piece on each side . 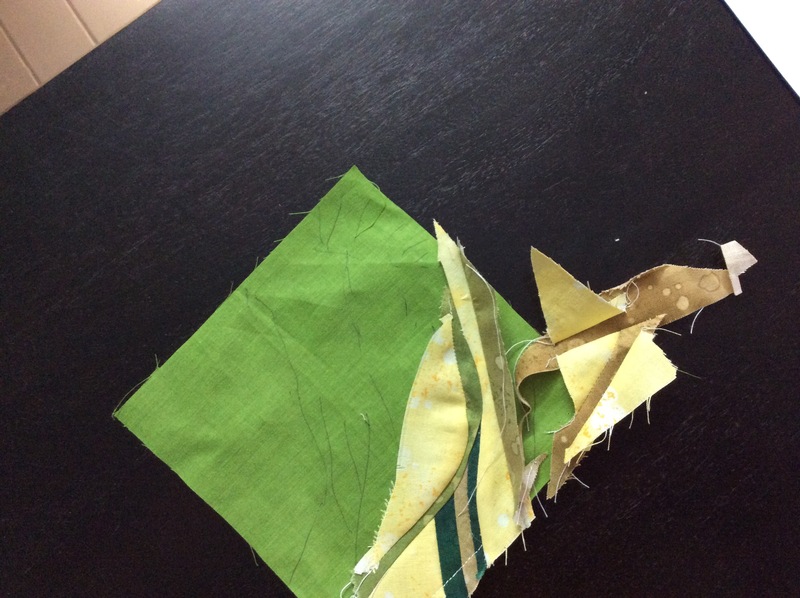 When appliquéing, the fabric gets `pulled in’ unevenly, and you will need to square it to the right dimensions, once done. Spray starch and iron your background fabric, so that there are no creases! Fold and iron (the centre part only) fabric twice to mark the centre with sharp creases. Tape the background fabric, right side facing the light on top of the pattern. 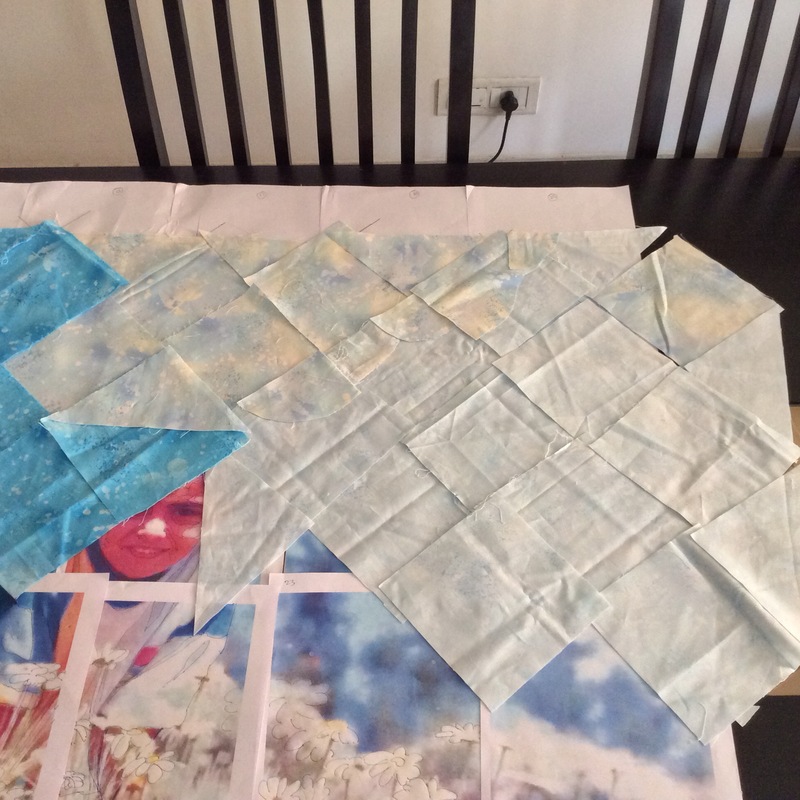 So now the wrong side of fabric will be visible to you …Match the centre of the fabric to the centre of pattern. And trace with fabric pen in contrasting colour. I use a lead pencil, which would not work on light coloured or white fabric. Now we have our pattern traced on the wrong side of the background fabric! And we are ready for the next step. 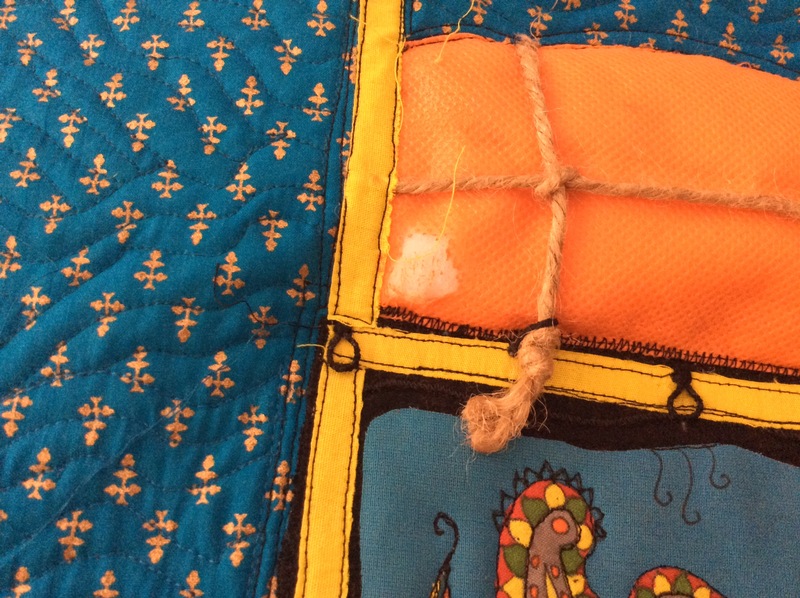 Pin/ tack or tape your appliqué square to the right side of the fabric, smoothing it out . Hold it against the light to ensure your pattern is completely covered, leaving a seam allowance all around. 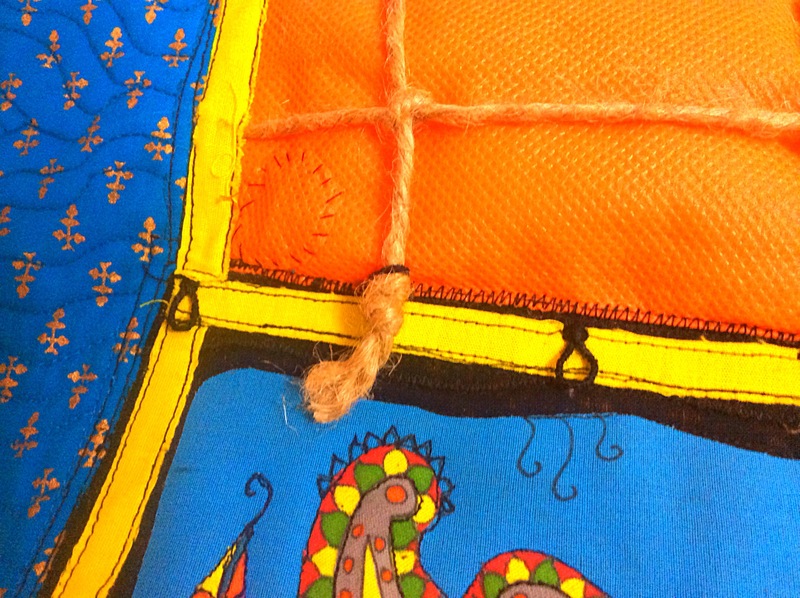 Flip over to the reverse side and go over the pattern with a running stitch in contrasting thread. Tip: You can afford to take large stitches on wide curves and straight edges. The sharper the curve, the smaller the stitch! This is done! Here it is from the right side. 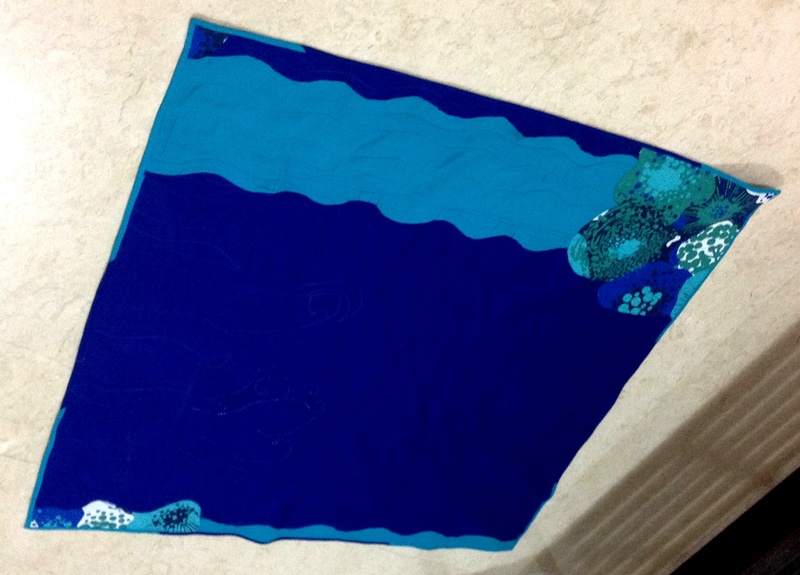 Here is another block, the appliqué fabric basted in place on a corner. This is when I had just discovered that the joys of paper tape vis a vis pins! Roughly trim around the pattern, leaving just about a ¼” allowance . For the time being, do not attempt to trim into sharp curves and the reverse appliqué portion! A few tutes recommend skipping this step altogether, and trimming only as you go along. Start location – Start in an area which is straight or a fairly wide or gentle curve. In my block above, I could have started on the straight basket base. I am starting on the wide handle above. Even out the seam allowance here. 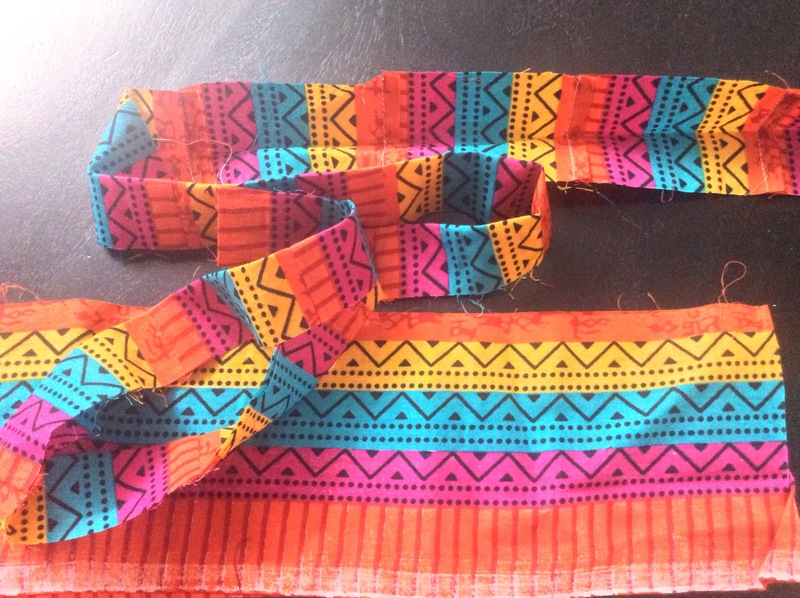 A ¼ ” or less seam allowance works great on wider curves. With a washable fabric marker pen ( I’ve used a lead pencil), go over the basting line a few inches ahead of where you will be working. This will work as a guide for the seam line. As we go along, we continue to mark the seam line in this manner. Several tutorials suggest using the hole made by the basting as a guide. My ageing eyes prefer a drawn line! Seam allowance – Trim your seam allowance as you go along. Your seam allowance is not a constant. For wide, gentle curves and straight edges, keep it at ¼” . Since there are no exposed seams, for smaller pieces you can reduce the seam allowance. Another tip is sharper the curve, the smaller the seam allowance. Curves – Notch all curves – as you approach them. You would generally read that it is not necessary to make notches in convex (fat) curves, and that is quite true. But I find that doing this reduces the seam bulk and gives you a smoother curve. As for concave (hollow) curves , it is imperative to make notches. Again, the rule is, sharper the curve, the closer the notches! Sewing sharp (pointed) outer corners – as in leaves, petals…As you approach a pointed outer corner, trim the corner seam allowance to a blunt 1/8″ or less. Notch as liberally as you dare! Remove the hand basting stitches only up to the corner. Stitch right up to the point and fasten the thread by taking one or two back stitches on the wrong side. Now remove the basting on the other edge. 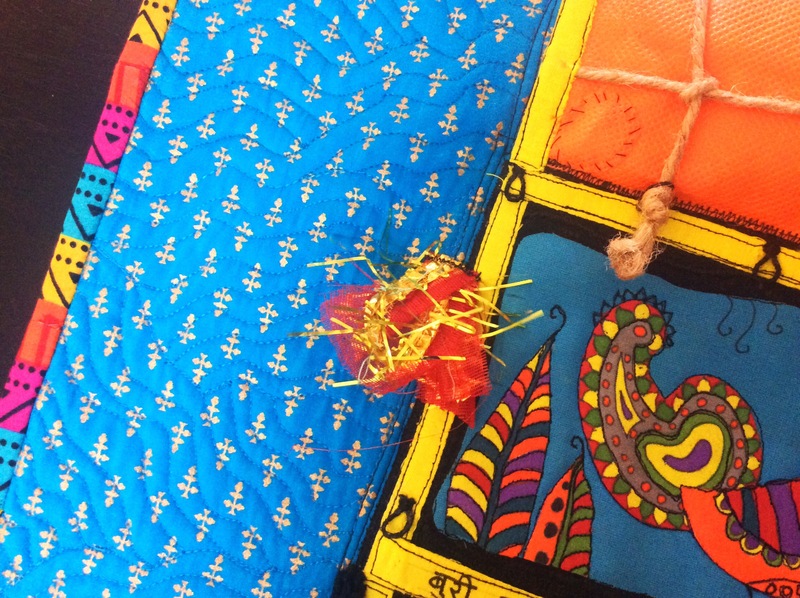 With a toothpick, ease in the fabric gently, rolling it over inside the tiny space. You may need to trim the seam allowance further as you do this. Remove the basting on both edges . Now, with the toothpick, ease in the seam allowance on both the edges. Remember, gentle is the word! Sharp curves (not pointed) –Make two notches on either side of the corner, instead of a single cut as for a pointed corner. The Stitch – I’ve not come across any description of it anywhere, so I do not know what it is called. It is something like the ladder stitch, or even the blind stitch, but not quite… invented it when trying to make my appliqué stitch invisible! It is basically a running stitch. The lower stitch is visible on the wrong side. 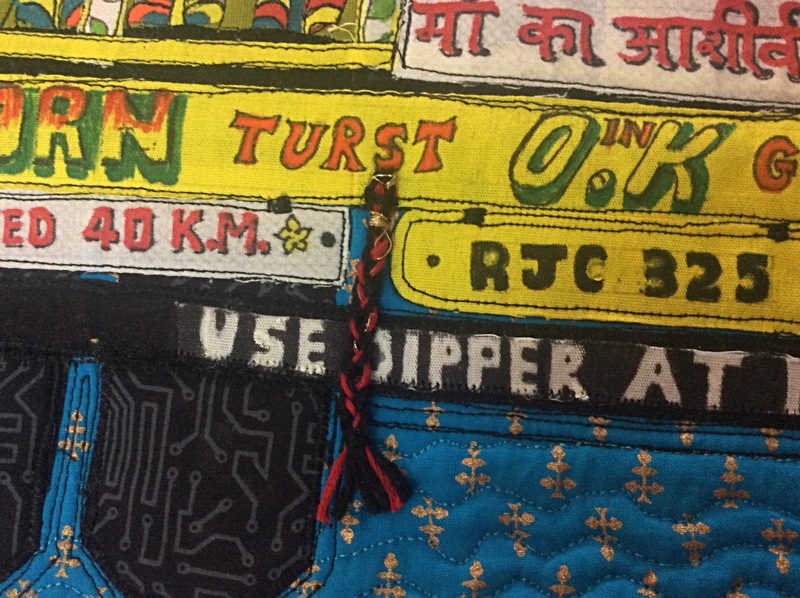 The upper stitch is hidden, in the fold just above the seam turning, but below the visible part of the appliqué. I begin by bringing the needle straight up, on the right side on the appliqué, just a thread or two inside the edge. Then I go right back in the same place, but not all the way to the wrong side of the fabric. I stop in the fold above the seam allowance. Travel a few millimetres in that fold and then go down to the wrong side. Take a stitch and come up to the right side again as in the previous step. The stitch is totally invisible on the top! Except for a tiny hole, which can be smoothed away. On the wrong side it shows up just a thread or two inside the pattern line. I find hand appliqué really relaxing! I am sure you will, too! 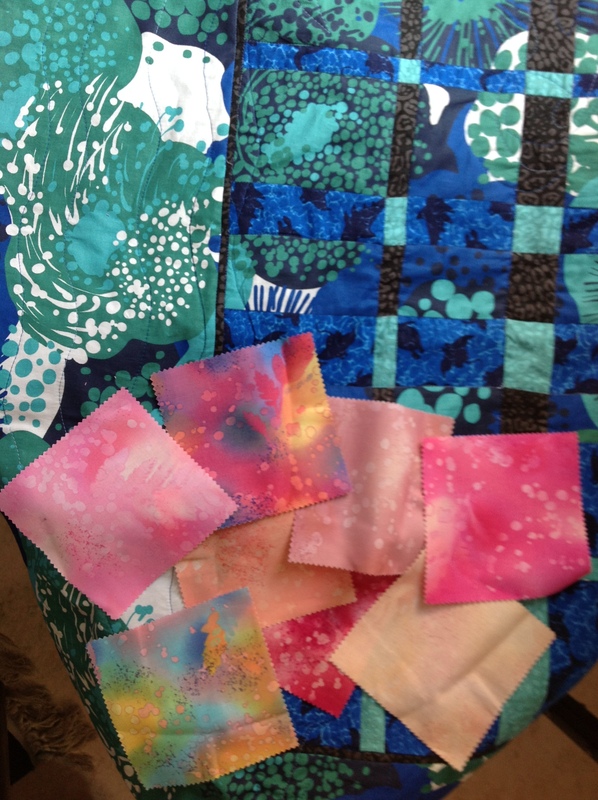 All the blocks shown are from the Just Takes 2 2012 quiltalong…and here is a great hand basting tutorial from the same site. You can see my quilt top containing all the above completed appliqué blocks here. 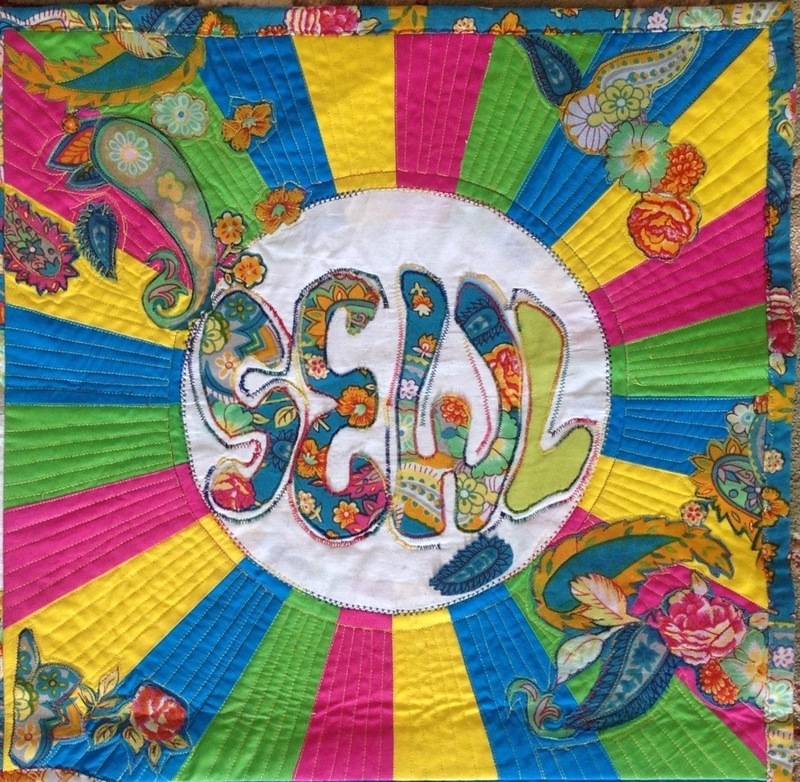 My online quilting forum Desi Quilters’ monthly challenge for January was to come up with a quilted wall-hanging for my sewing place with text in it! And the entries were to be anonymous too – for the group. I thought long and hard and hit upon hippie art, very popular when I was growing up! And I had the perfect fabric for it, with bright flowers and paisleys! The text had to be pieced according to the challenge rules, and what word better than `PIECE’ to piece? 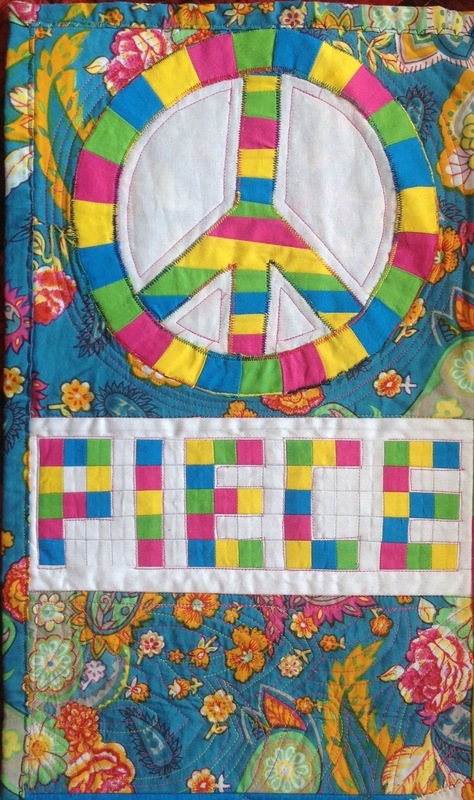 I love playing around with words, so the first part of the quilt was designed with a peace symbol! 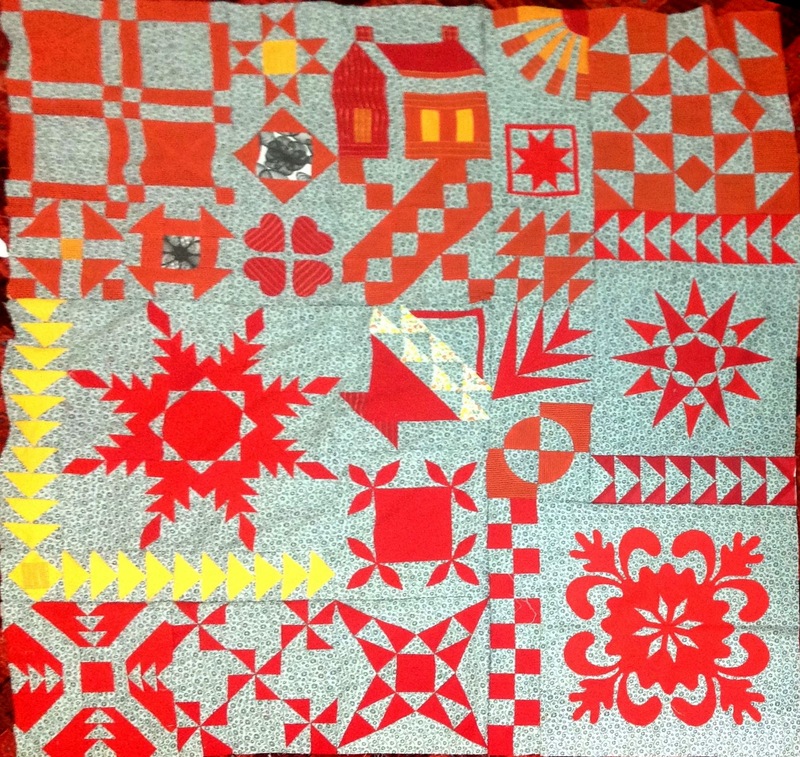 I used Elizabeth Hartman’s (of Oh,Fransson!) method to piece the text, using lightweight stabilizer – the pieces are ready at 1/2″. 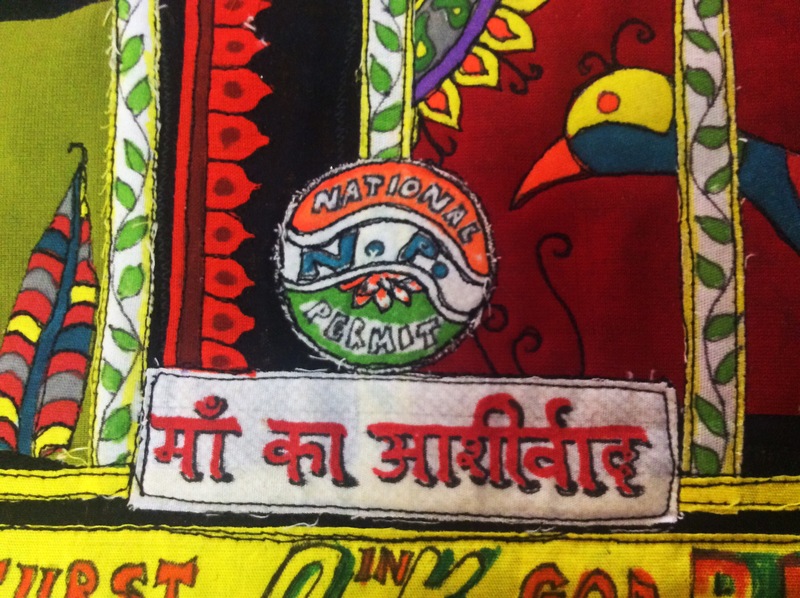 When we were teenagers, a favourite doodle was a name or slogan written in a circle in this `font’! ( We were all in love with Rhett Butler of Gone with the Wind, so our rough notebooks were full of imaginatively decorated doodles of `Rhett’ in circles and hearts!) 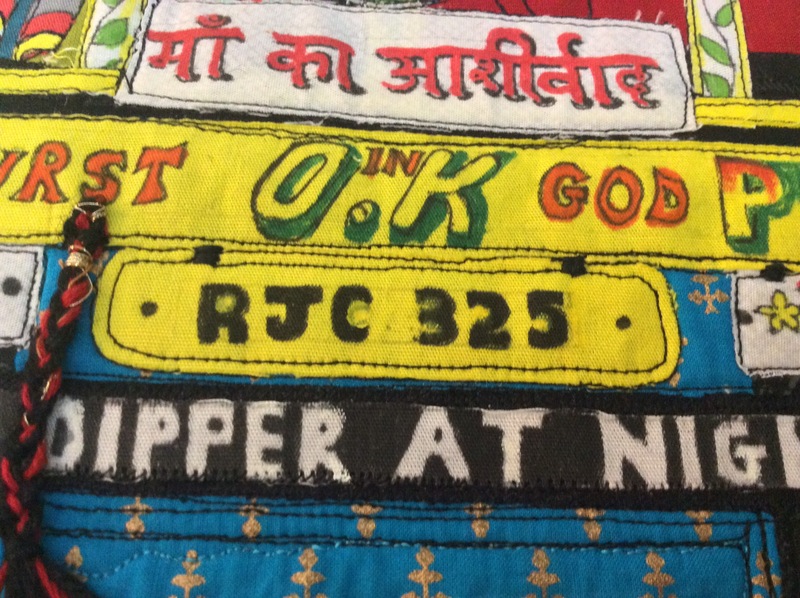 So this bit of art was a must for my quilt! After much brainstorming, I hit on SEWL – a play on SOUL! 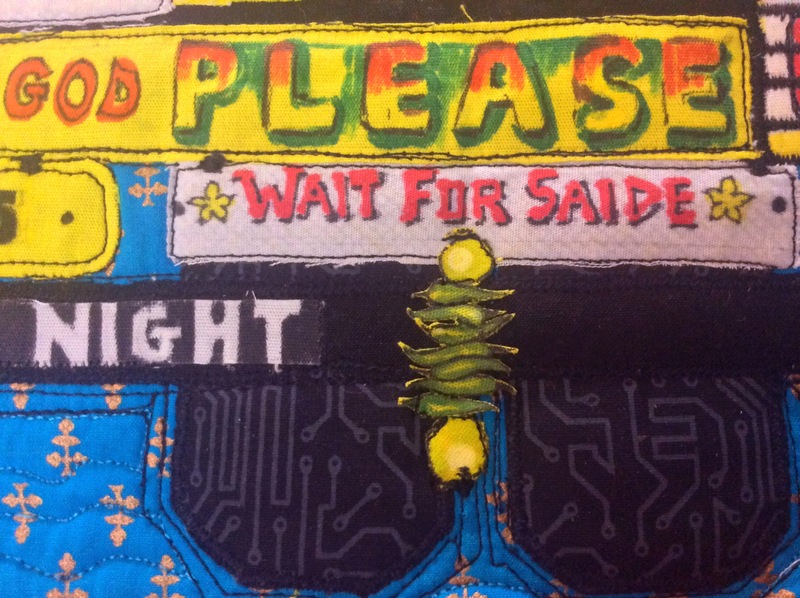 (DH thinks the word-play is incomprehensible; I am quite proud of it, sew there!) So in went the `SEWL’ into a circle with rays radiating from it. Now came the brilliant part (IMNSHO – where H stands for humble!) I cut out the smaller ring (5′ inner and 7″ outer radius) and used it to border my `PEACE’ symbol! This ring had to be raw edge appliqued. So I had PIECE and I had SEW, but wanted something more! After browsing through hippie slogans a hundred times, the brain wave struck…tranquility! So the final block was designed. 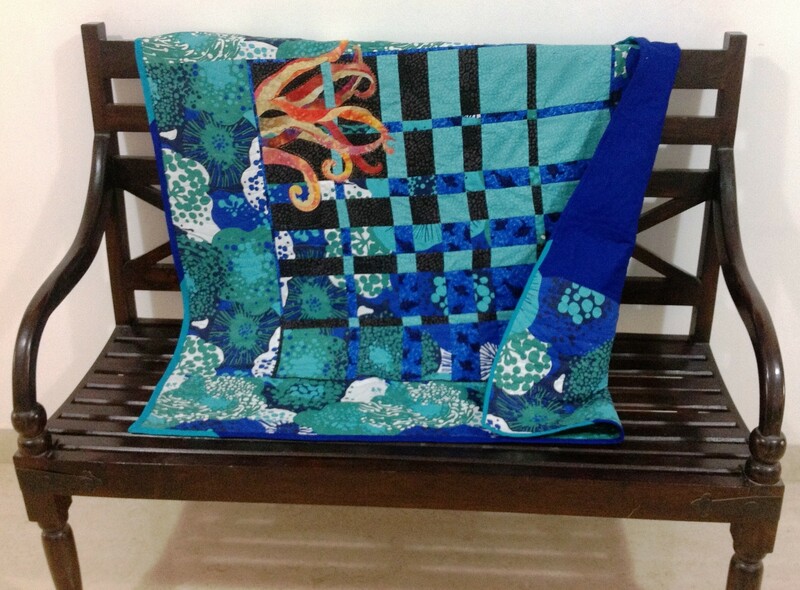 For this block, I was inspired to attempt Chenille quilting, explained so beautifully by by the talented quilter Vani Roy in a Chenille Quilt Along on the Desi Quilters’ facebook forum. The block was designed as a long narrow horizontal panel below the other two blocks, to give a feeling of expansiveness. The oversized full moon linked up the three blocks. I also wanted to add a bodhhi tree, but TRANQUILTY is a huge (pseudo)word! 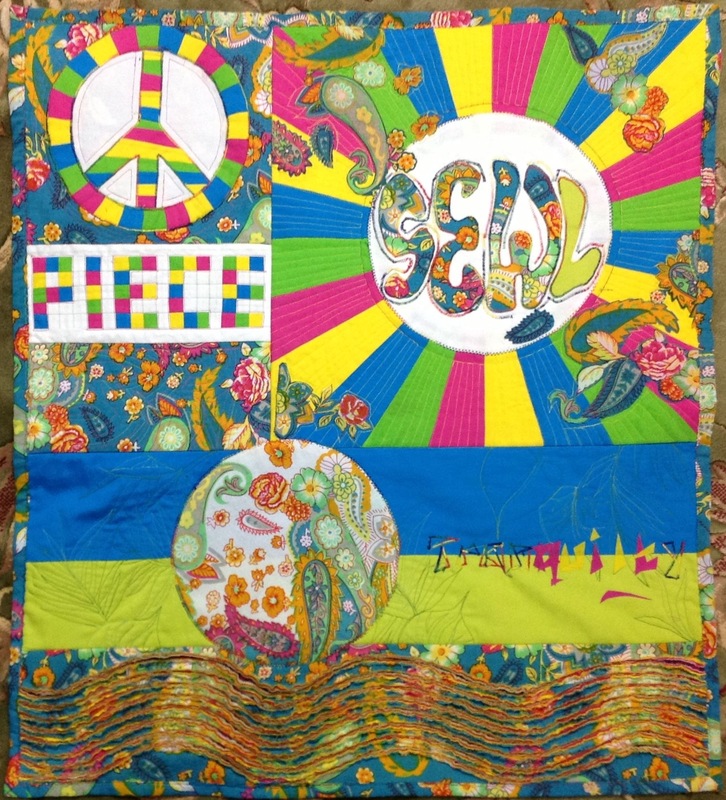 I quilted the whole text, and fused the letters QUILT on it. 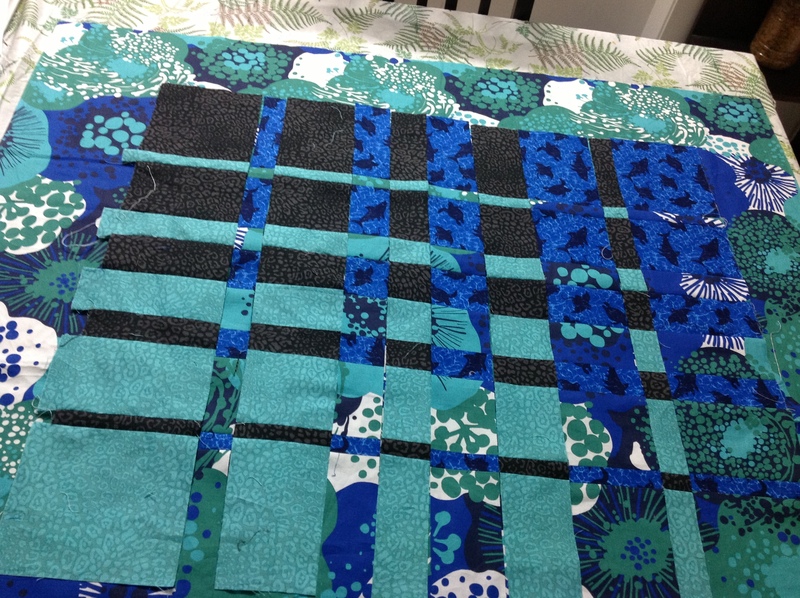 I did minimum quilting on this block, because I did want it to look to busy. The wall hanging is now a perfect size for my sewing corner! 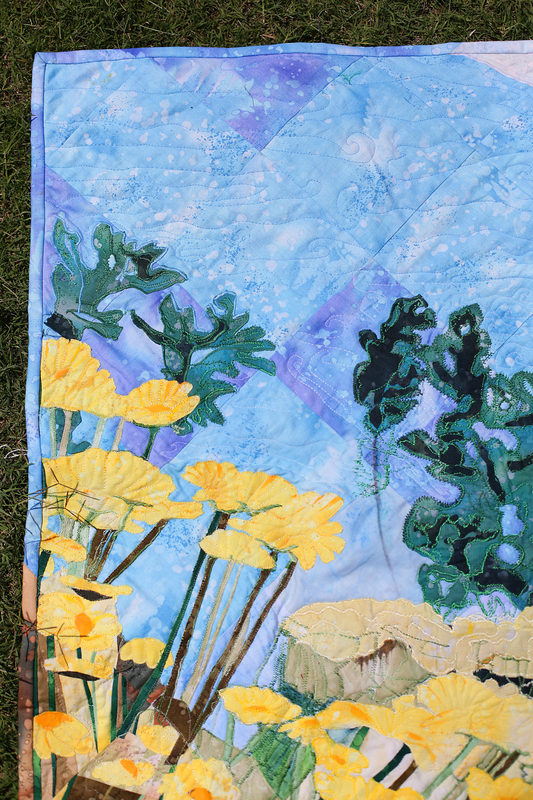 Here are three hand -sewed blocks I finished since I last blogged about this quilt, months ago! The first applique( Hawaiian look) block uses the back basting technique. I traced the pattern to the wrong side of the background and basted the applique piece over it, turning it in as I went along. It also has reverse appliqued diamonds in the centre. 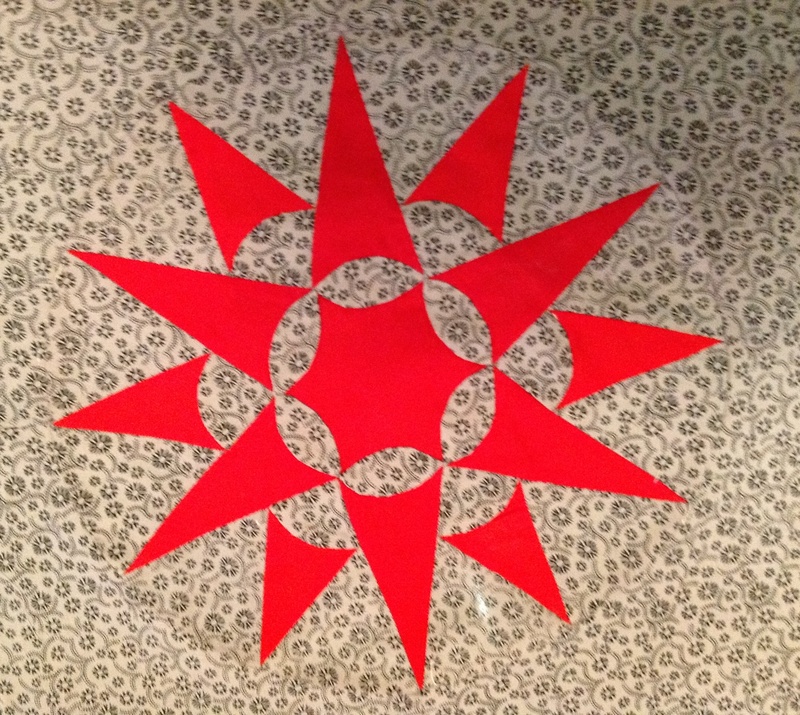 The second block, Grandma’s Favourite Compass is paper pieced by the EPP method . The circle was hand sewed to the background. 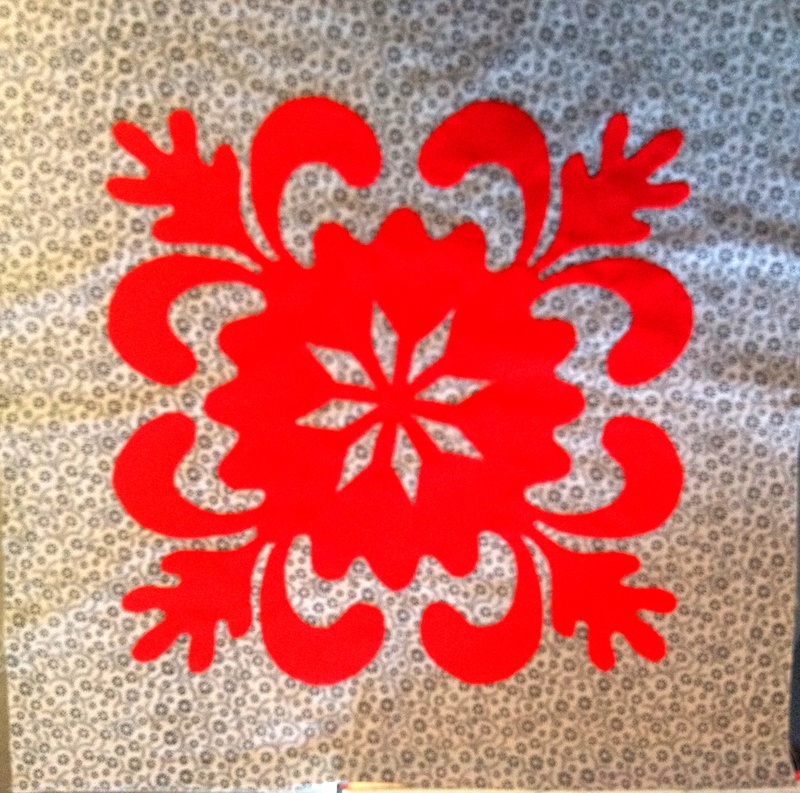 For the third block, I appliqued after tacking the leaves on to paper,like you would for EPP). 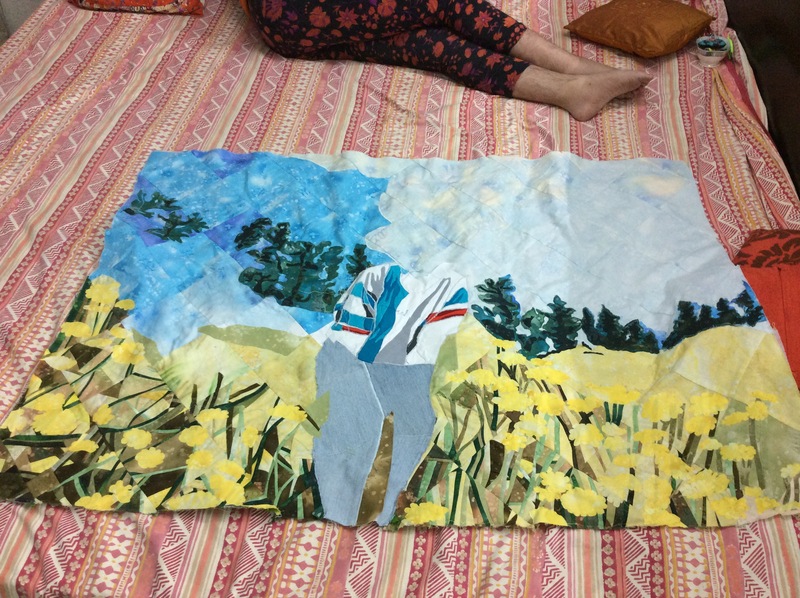 I then slit the background fabric to remove the paper. 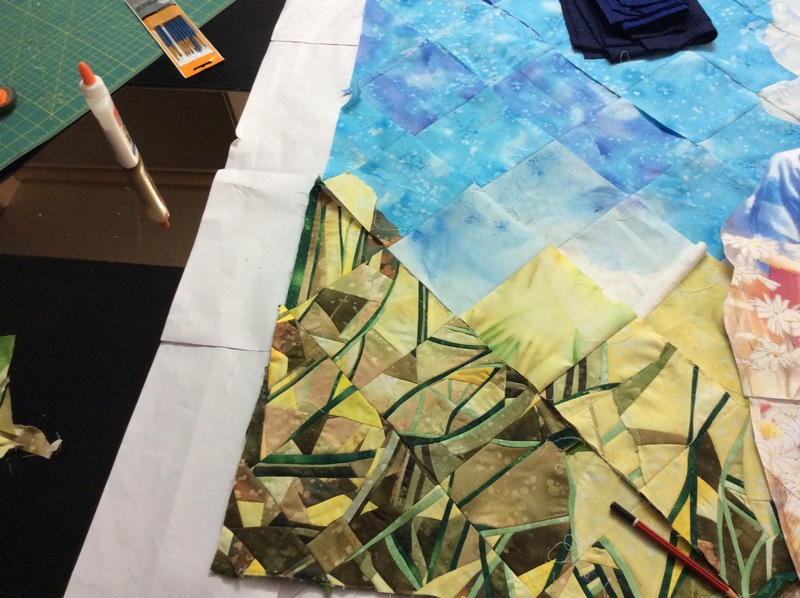 Section A of justtakes2 quilt – first quarter of the quilt finished! Pictures of many of these blocks are here and also here as well as here. And here are some more completed blocks. The bottom left Cathedral windows block needs some more work, I just discovered! So this is where we stand today! I do have a few 4-patch strips that I have not photographed, but which count as blocks, anyways! I have finished tracing out two more applique blocks – which will probably take me ages to finish! I shall sew them in the evenings, sitting in front of the TV. During the day, shall do the machined blocks! At the end of each day, I shall post pics of the day’s progress! Do look in to have dekko and drop a line of encouragement! 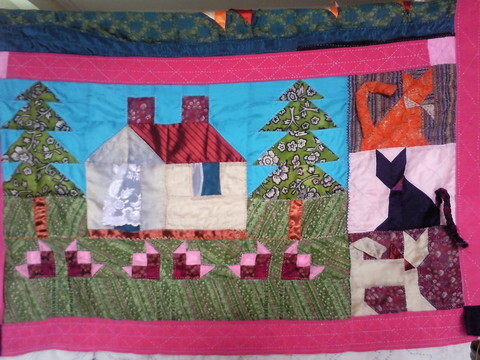 I designed and made this little quilt for my little grand niece. 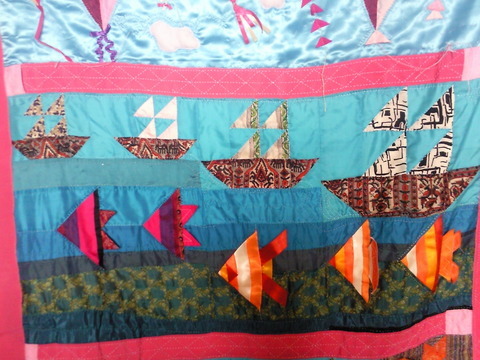 It is a number / counting quilt – also a land, sea, air quilt – made with silks and satins and oodles of love. Anyone is free to copy it in any which way they like. On Land -1house, 2trees, 3 cats, 6 flowers : The house has billowing lace curtains on the window and door 🙂 The three cats have different tails – three dimensional which can be tugged at by the baby!